La Badia (Labbadia), in Italy, 3396. La Bastie (Labatie), Sir Anthony Darces, Sieur de, a French knight, comes to Scotland, sent to Denmark (Jan.May 1514), 2443, 2461, 2561 (? "Cavalier Bianco"), 2578 (3), 2579, 2973, 3216. La Baume, G. (or E.) de [Madame de Marnay], letter from, 3163. -, -, -, her father and grandfather, 3163. La Beauchieff. See Beachy Head. La Borde, Martin and Michael de, ship masters, 2909. La Bourda, Petrus de, 1506 (2). Labryt, M. de. See Albret. La Calege (Callay), Guillaume de, French prisoner, 2053, 2172:p. 928. Lachaux (Lasschaw), Charles de Poupet, Sieur de, 2203. La Chesnaye, Nic. de, of Rouen, 1231. Lachorensis (Lathorensis), bishop, 438 (1 m. 24). Lackford (Lakeford) hundred, Suff., g. 2861 (25). Lackham (Lacham, Lackeham, Lakham), Wilts, 438 (1 m. 13), 438 (3 m. 3):g. 924 (29). La Clee ..., M. de, a French captain, killed in Milan, 2022. Lacon (Laton), Th., p. 1543. La Coste, Andrew de, of Bruges, 19578. La Croce, Zuan Francesco de, 31989. Lacy (Lascy), Henry de, charter of, g. 632 (27). -, - (Laci), Robert de, charter of, g. 709 (11). Lacy, Doctor, King's physician, 20 (p. 13), 82 (p. 42). -, -, Mr., 707 (p. 383). -, -, Margaret, g. 784 (26). -, - (Lascy), Nic., g. 54 (3). -, -, Wm., g. 784 (26). Ladde (Lade), Rob., 438 (2 m. 20), 438 (3 m. 28). Ladislaus, King of Hungary and of Bohemia, 37, 365, 432, 442, 450, 463, 564, 694, 724, 739, 965, 1351, 1534, 2379, 2838, 3172, 3218, 3405. -, -, -, letter to, 694. -, -, -, his son. See Louis. La Fava, Alex. de, merchant of Bologna, 1785, 2668:pp. 150910, 1514, 1519:g. 3324 (31). -, -, Ludovico de, merchant of Bologna, 121, 162 (p. 88), 329 (p. 151), 1393 iv., viii., 1463 (iii., vi., viii.):p. 1506:g. 132 (91), 357 (13), 1415 (10). La Fayette (Laclete, La Faiete), Sieur de, French prisoner, captain of the Duke of Alenon's men, 2172, captain of Boulogne, 2173 (3), 2237, 2254 ii., 2299, 2392 iii., 2974, 3087, 3215, 3252. -, -, -, letters to, 2871, 2934. Laferthy, Donald, clk., p. 1524. Lago, Ralph, Bluemantle pursuivant, York herald, g. 731 (34), 1948 (5). -, -, -, letter to, 3227. La Gorgue (le Gorghe), in Flanders, 2256. La Guiche (Ghysse, Le Gyche, Lagishe, La Guysse). ierre de, French ambassador to Maximilian, 1127 (p. 539), 1241, 1245, 1252; to England, 3461, 3476, 3580. La Hay, Lord Simon de. See Ley. Laindon (Leyndon, Leindon), Essex, 438 (2 m. 28). -, -, rector of, p. 1526. Lainston (Layneston), Hants, 438 (2 m. 33). Lakareta, Sebastian de, ship owner, 2304. Lake, Ric., of the Guard, p. 1518. Lakwyke, Lanc., 438 (4 m. 8). Lakyn (Lakan), Lacan, Lakayn), George, 438 (2 m. 32). -, -, Sir Ric., 438 (4 m. 14). -, - (Laken), Th., 438 (4 m. 14):g. 257 (49), 1662 (1), 2484 (9), 3499 (12). Lalaunde, Stephen de, minstrel, 20 (p. 13). Lalemant, Jean, receiver general of Normandy, 2199. -, -, -, order to, 2297. La Leu or Lalu, Jean de, French prisoner, 2053 (p. 928), 2172. Lalo, Alonso de, Spanish merchant, 1693, 1797. La Londe, Sieur de. See Bigars. Lalu, Jean de. See La Leu. La Magnana, near Rome, 408, 1020, 2373, 2428. Lamana, Cornw., g. 1083 (2). La Marck, Everard de, bp. of Liege, q.v. -, - (Marche, Marsch), Robert de, seigneur de Sedan et Fleuranges, in the French service, 1146, 1229, 1265, 1301 (p. 598), 1647, 1813, 2083, 2392 iii., 2957, 3103, 3400. See also Arenberg, Sieurd'. -, -, -, one of his sons, 1813, 2083. Lamarsh (Lammersh, Lambemersh, Lam Merche, Lanmershe), Essex, g. 381 (51, 102), 2330 (4). -, -, rector presented, g. 1044 (16). Lamb or Lambe, Isabella sister of John, a Scot, 1545. -, -, John, 438 (2 m. 31). -, -, Rob., g. 3499 (55). -, -, Walter, g. 1170 (17). Lambert, Bertram, Sieur du Val, 3349. Lambert or Lambard, Gilbert, 20 (p. 15). -, -, John, 45, 1803 (2 m. 5):g. 969 (70). -, -, Miles, mayor of Leicester, 102, 438 (3 m. 16):g. 1221 (41). -, -, Nic., g. 54 (82), 784 (30). -, -, Th., 438 (4 m. 23). -, -, Wm., 20 (p. 15), 707 (p. 383), 1032 (2), 1803 (2 m. 5), 2337, 3333:g. 2055 (62). Lambeth (Lambede, Lambheth), Surr., 438 (1 m. 22 bis), 438 (2 mm. 4, 9), 438 (3 mm. 1, 6, 9, 18, 23 bis, 26, 289), 1235, 1445, 1450 (p. 661), 2026, 2620 (4), 2651, 2714:p. 1516:g. 1524 (17), 2684 (8, 55), 3107 (52). -, -, letters dated at, 219, 935, 2163, 2451 ii., 2606, 2622, 2624, 2638, 26789, 2692:pp. 1511, 1517. -, -, grants dated at, g. 132 (66), 2684 (25, 27, 31, 356, 40, 589, 64, 66, 69, 71, 77, 834, 86, 90, 1026), 2772 (2, 57, 13, 15, 17, 20, 26, 37), 2861 (23), 2964 (31), 3324 (43, 45). Lambeth Marsh (Lambythmarche, Waterlambyth), Surr., 438 (3 mm. 3, 9, 14). Lambourn, Chipping- (Chepynglambarn), Berks, g. 784 (38). -, -, vicar of, 438 (3 m. 19), 438 (2 m. 20). Lambourn, Upper-, Berks, g. 485 (55, p. 298). Lambton (Lumton), Dham., 438 (2 m. 19). Lamerton (Lamarton), Devon, 438 (1 m. 17), 438 (2 m. 22). Lamington (La Myngton), in Scotland, rector of, 2990. Lamkyn, Wm., 438 (4 m. 22). Lamme, Th., g. 2137 (7). La More. See Moor Park. La More, Marcellus de, King's serjeant, surgeon, 2404, 2480 (29), 2899, 3501:g. 2964 (46). -, -, -, signature of, g. 2964 (46). La Motte (Delamote, La Mothe), John de, a Frenchman, 1262 (p. 578 bis), 1298, 1302, 1315, 1380, 1467, 1501, 1504 (pp. 6923), 1584, 1645, 1775 (pp. 80910), 1936, 2246 (2), 2313n., 3349. -, -, -, letter from, 1584. La Mote, Sieur de, App. 26. See Heulle, Sir Guyot. Lampeter (Lanpetyr), co. Merioneth, 1803 (1 m. 3). Lampets (Lampyttis), Essex [in Fyfield], g. 289 (16). Lamplew, John, g. 1494 (9), 2484 (9), 3499 (12). Lamport, Ntht., g. 1316 (15). Lamport or Lamporth, Old. See Langport. Lanam, Cornw., 438 (4 m. 14). Lancashire, 559, 2246, 2651:g. 11 (10), 1365 (3). Lancaster, 438 (2 m. 8), 438 (3 mm. 5, 9), 2910:g. 485 (23), 969 (38). -, -, mayor of, 438 (3 m. 9). Lancaster, county palatine of, 438 (4 m. 26). -, -, -, chancellor, g. 804 (29 xiii. ), 833 (45 iv. ), 1365 (3). Lancaster, Thomas earl of (temp. Edw. II. 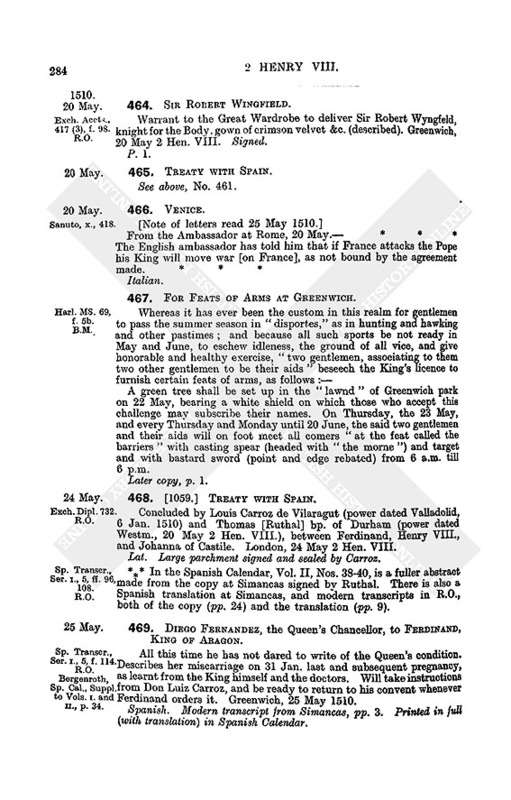 ), charter of, g. 414 (18). Lancaster, duchy of, 1 (p. 2), 438 (2 m. 6), 1066, 2505:g. 1316 (11). 3226 (2). -, -, -, chancellor of. 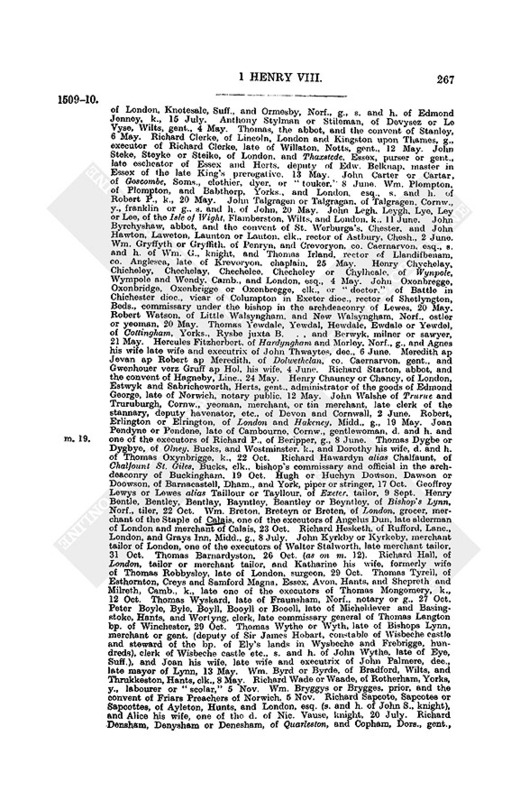 See Fowler, R. (14621477); Empson, Sir R. (under Henry VII. ); Marney, Sir H.
-, -, -, clerk, 438 (1 m. 25). See Heydon, W.
-, - receiver general. See Gerard, M.; Bonham, T.
-, -, -, wards of, 392. Lancaster herald. See Wall, T. (3 April 1510). Lancaster (Longcastre, Loncastre), Edw., 438 (2 m. 12). -, - (Lancastre), Geoffrey, p. 1546:g. 804 (29 iii. ), 833 (45 ii. ), 1365 (3). -, -, Hugh, 438 (3 m. 5). -, - (Lancastre), Joan, g. 833 (53). -, - (Lancastre), John, g. 833 (41). -, -, John, prior of Launde, 438 (3 m. 18), 1493 ii. -, - (Lancastre), Stephen, clk., g. 833 (41). -, - (Lancastre), Th., g. 833 (53). -, - (Lonkester), Wm., g. 94 (2), 132 (50), 519 (30), 3324 (19). Lances ("clyftes"), 1420. See also Ordnance. Lanchester (Langehestre, Langhester), Dham., college of, p. 1525. -, -, letters dated at, 1555, 1569, 16312, 16367, 1639. Landeck, in Germany, letter dated at, 562. Landhill (Loundehelle), Devon [near Halwill], 438 (2 m. 7). Lando, Piero, Venetian ambassador at Trent, ambassador at Rome (Oct. 1513), 1352, 1385, 2298, 2335, 2373, 2696, 3081, 3206, 3236. -, -, -, letters from, 2373 ii., 2397, 2981, 3533, 3547, 3574. -, -, -, letters to, 2696, 2952, 2980, 2998, 3009, 3190, 3198, 3404. -, -, -, commission to, 2298. Landrean, Cornw., g. 1083 (2). Landriano, Jerome de, general of the Humiliati, 1277 (p. 587), 1301 (p. 595). Landry, Agnes, John and Philip, g. 784 (24). Land's End, the, in Thames mouth. See Foreland. Landulph, Cornw., g. 1083 (2). Landwade (Landewade), Camb., 438 (1 m. 5), 438 (4 m. 7):g. 651 (6). Lane, Edward, archd. of Surrey, 361. -, -, Ralph, p. 1548:g. 54 (47), 1494 (9), 2222 (16 Ntht. ), 2964 (39), 3226 (27). -, -, Ric., 438 (1 m. 1). -, -, Wm., 1803 (1 m. 6):p. 1541:g. 804 (20). -, -, Wm., merchant of the Staple, 438 (3 m. 5). Lanell, John, g. 749 (39). Laneshaw (Lowerlammeschawe), Lanc. [in Colne], 438 (4 m. 14). LANG, MATTHEW, BP. OF GORZ (Gurce, Gurse, Gursa or Gurk, near Trieste in Carinthia), chancellor of the Tyrol, cardinal (1511), 83, 113, 130, 333, 402, 417, 522, 554, 562, 565, 590, 614, 649, 674, 708, 714, 718, 7536, 761, 773, 777, 77980, 783, 793, 818, 866, 880, 965, 1007, 1277 passim, 1288, 1293, 1301 (pp. 5968), 1311 ii., 1312, 13389, 13445, 13524, 1367, 1378, 13845, 1432, 1449, 14689, 1483, 1486, 14889, 1491, 1519, 1521, 1555, 1557, 1559, 1568, 1637, 1677 (p. 770), 1680, 173940, 1749, 1884, 1895, 2070, 2106, 2113, 2154, 2173 (3), 2242 (2), 2259, 2276, 22912, 2329, 2341, 2389, 2428, 2448, 2456, 2462, 2476, 2524, 2568, 2585, 2645, 2736, 27456, 2770, 2800, 2859, 2869, 2891, 2915, 2921, 2932, 2945, 2969, 3014, 3080, 3126, 3192, 3218, 3259, 3405, 3541, 3547, 3556:App. 10, 11. -, -, -, letter from, 753. -, -, -, letter to, 1277 (p. 586). -, -, -, brother in law of, 1895. -, -, -, made cardinal, 714. -, -, -, treaties concluded by, 1486. Lang or Longe, Marcus, spear of Calais, 193 (p. 101):g. 257 (79). Lang or Lange, Th., 438 (4 m. 14). -, -, Wm., 438 (2 m. 4). Langbarugh (Langbargh), Yorks, 438 (2 m. 5). Langdale, Agnes, d. and h. of Wm., 438 (3 m. 2). Langdon, Devon [in Wembury], 2537. Langdon, Westmld., g. 1732 (1). -, -, John, p. 1535. Lange, Mons. 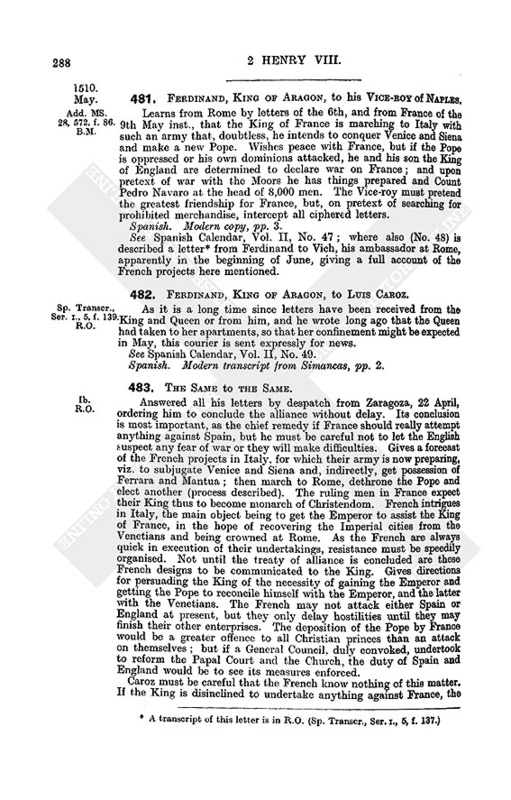 de, French ambassador in Spain, 1127 (p. 539), 1138. Langefellowe, Peter, chaplain, 3480 ii. Langford, Berks, 438 (1 m. 19). Langford, Norf., 438 (4 m. 13). Langford (Landford, Lanford), Notts, 438 (3 mm. 5, 16). Langford, Oxon, 438 (1 m. 16). Langford Parva, Wilts, 438 (2 m. 13):g. 604 (24). Langford, Anne, d. and h. of Sir John, g. 614 (76). -, - (Longford), Sir John, 20 (p. 14), 396:g. 257 (74), 414 (76), 563 (12), 632 (30). -, -, -, Margaret his wife, g. 414 (76). -, -, Margaret, 438 (1 m. 15). -, - (Lanford), Margaret, relict of Sir Nicholas, 438 (4 m. 15). -, - (Langforth), Sir Ralph, 438 (3 m. 1):g. 1948 (94), 2964 (25). -, -, Ralph, s. and h. of Nic., s. and h. of Sir Ralph, g. 1732 (10), 2964 (25). Langfordes Place, Essex, g. 1662 (58). Langham, Essex, g. 94 (35 p. 50). Langham Parva, Norf., rector of, 438 (2 m. 31). Langham (Langeholme), John, 438 (3 m. 10). Langharne (Langhern), co. Carmarthen, 438 (2 m. 19). Langholm (Langhame), in Scotland, p. 1260. Langholme, Cumb., 438 (1 m. 6). Langland, Luke, g. 632 (70). Langley, Berks [in Hampstead Norris], 520:g. 94 (51), 546 (27), 632 (64), 682 (8). Langley, Bucks, 1803 (2 m. 4). Langley, Derb., 438 (1 m. 24). Langley (Langeley), Norf., 1803 (1 m. 1). -, -, abbey, Wm. abbot of, 1493. Langley (Langle), Nthld., g. 485 (26), 2863 (5). Langley, Oxon, g. 546 (33), 682 (8), 885 (14). Langley Marsh (L. Marres, L. Marreys), Bucks, 438 (3 m. 13), 438 (4 m. 3):g. 94 (35). Langley Park, Kent, g. 1524 (45). Langley Regis, Herts, g. 94 (35). -, -, priory of Black Friars, confirmation for, g. 485 (45). Langley (Longley), Friar (Friar Bonaventure, provincial of the Observants), 2394, 2423, 2440. -, -, Isabel, d. of Edmund, 438 (3 m. 16). -, -, James, g. 2055 (70). -, -, John, g. 2862 (7). -, - (Langeley), Katharine, widow of Henry, 438 (3 m. 4). -, -, Ric., g. 784 (3). -, -, Th., 438 (3 m. 22). -, -, Alice sister of Walter, 438 (4 m. 16). Langney Gate (Langneygotte), Suss., g. 132 (51). Langosok, Alice, 438 (3 m. 22). Langport (Lankeporte), Kent, 438 (3 m. 24). Langport (Langporth, Olde Lamporth), Kent [in Lydd], g. 289 (17). Langport (Lamport), Soms., 1803 (2 m. 5). Langres, in France, bp. 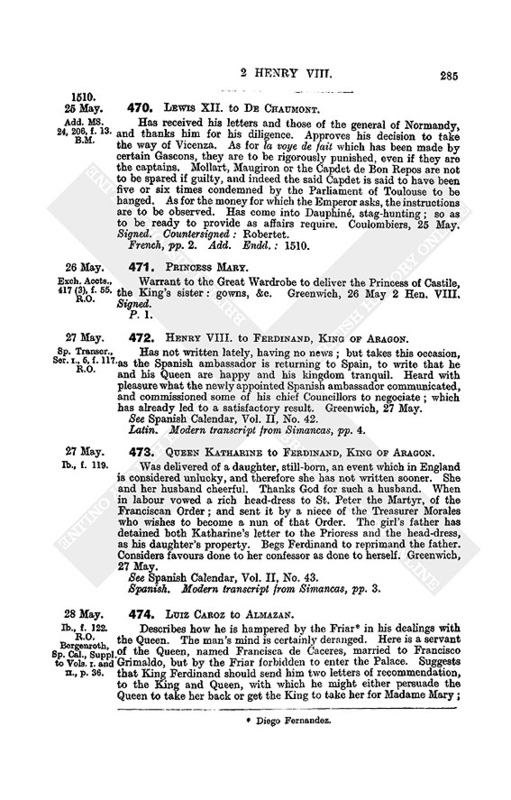 (and duke) of, 3417 (p. 1437). Langridge (Langrythe), Soms., 438 (2 m. 11). Langrig, Wm., 1803 (1 m. 6). Langston, Ric., 45, 438 (3 mm. 10, 32). -, -, Th., sheriff of Beds and Bucks (A.D. 14967), 438 (3 mm. 10, 32):p. 1534:g. 54 (47), 969 (23), 1494 (9), 2055 (95 ii. ), 2222 (16 Bucks). Langtoft, Linc., g. 1804 (32). Langtoft prebend, in York cathedral, 438 (2 m. 15). Langton, Dors., g. 2055 (58). 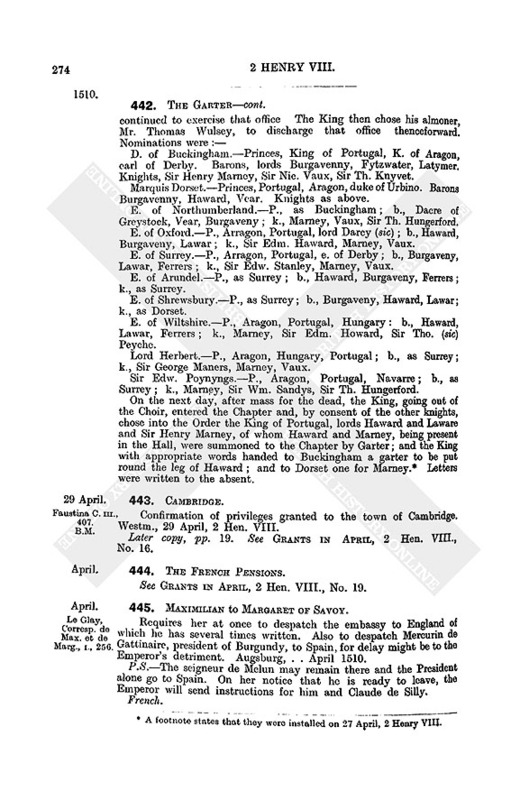 Langton (Lancheton), Linc., 438 (1 m. 11):p. 1525. Langton, in Scotland. See Lanton. Langton (Langtone), Yorks, rector of, 438 (1 m. 18). Langton Butler, Dors., 1803 (1 m. 6). Langton or L. Guylden, Dors., g. 2055 (111). Langton alias Long Blandford, Dors., 438 (4 m. 3). Langton in the Wold (L. in Le Old), Yorks, g. 132 (118). Langton, Henry, g. 709 (22). -, - (Langtoyn, Langeton), John, 438 (1 m. 11). -, -, John, alias Gerves, abbot of St. Mary Graces, London, 20 (pp. 15, 20), 438 (3 m. 16):pp. 152930. -, -, Mr. Rob., 20 (p. 16). -, -, Thomas, bp. of St. Davids (14835), of Salisbury (148593), and of Winchester (14931501), 438 (3 m. 15), 438 (4 mm. 19, 22). -, -, Wm., treasurer of Berwick, 2913:g. 94 (63), 804 (29 vii. ), 833 (50), 1365 (3). -, -, -, warrants to, 3030. Langtre, Lambert, 438 (3 m. 6). Langtrowe (Langetroe), John, 438 (2 m. 10). Langua or Llangua, co. Monm., 438 (3 m. 12). Languedoc, 406, 965 ii., 1081, 1647 (p. 743), 1750, 2633. -, -, general of. See Boyer, H.
-, -, impositio foranea, 3344. Langwith Bassett (Langquathbasset), Derb., 438 (1 m. 17). Langworth, Th., clk., g. 2055 (54). Lanhargh, Cornw., 438 (4 m. 16). Laner, in St. Allen? Lanherne (Lanheron), Cornw. [in Mawgan], 438 (4 m. 4). Lani, Wm., clk., a Scot, p. 1523. Lanivet, Cornw., 438 (2 m. 27), 438 (4 m. 14). Lanlivery, Cornw., 438 (2 m. 8). Lanlythan and Holy Cross chapel, i.e. Llanblethian and Cowbridge, q.v. Lannoy, Raoul de, Sieur de Morvilliers, bailly of Amiens, ambassador from France (Feb. March 1510), (died 29 June 1513), 363, 365, 385, 406, 526, 538, 1055:App. 10. La Noa, James de, trumpet, g. 2964 (49). Lansoy (Llansoy), co. Monmouth, rector presented, g. 1316 (42). Lanteglos park, Cornw., keeper of, g. 132 (27). Lanteglos (Lanteglas) juxta Stratton, Cornw., rector presented, g. 857 (1). Lanthony, St. Mary's priory, beside Gloucester, 438 (4 m. 17). -, -, -, cellarer of, 3195. -, -, -, confirmation for, g. 381 (7). 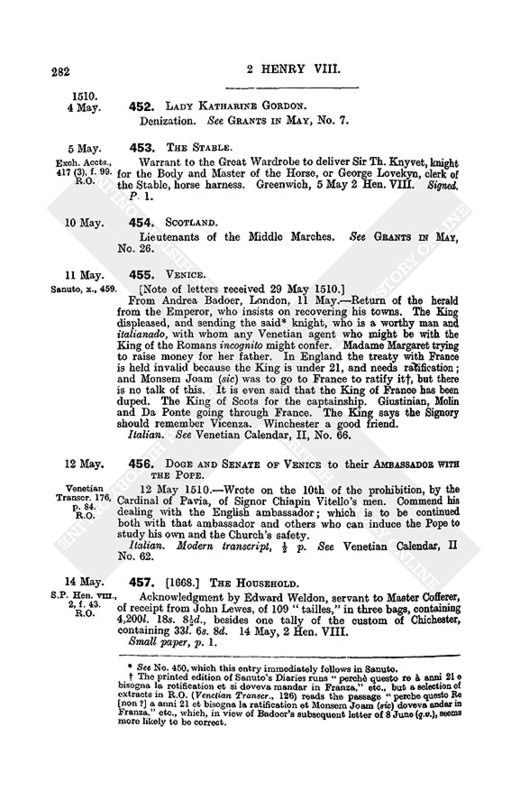 -, -, -, exemption from tolls, &c., g. 1221 (3). -, -, -, prior of. See Forest, E.
Lanthony (St. John's) priory or cell, in Wales, 438 (4 m. 17). Lanton or Longtown (Langton), in Scotland [near Jedburgh], 2443, 2913. Lantyan, Cornw., g. 158 (81), 2684 (37). Lanuce, near Bethune, 2392. Lens? Lanuza (Nosa, La Newce), Juan de, Spanish ambassador in Flanders, 1364, 1447, 1579, 1656, 1683, 1699, 2003, 2006 (p. 907), 2038, 2063, 2070, 2113, 21234, 2131, 2203, 2230, 2242, 2292, 2377, 2421, 25012, 2588, 2633, 2665, 2670, 2678, 2694, 2769, 2794, 2797, 2815, 2859, 2908, 2940, 2994, 3051, 3082, 3109, 3174, 3208, 3235, 3245, 3264, 3400. -, -, -, letter from, 2038 (2). -, -, -, letters to, 2003, 25012, 2525, 2583, 2711, 2859, 3406. -, -, -, instructions for, 1447. -, -, -, signature of 2377. -, -, -, his secretary, 3400. -, - (La Nua), Pedro de, brother of Juan, 19992001, 2006 (p. 907), 2079, 2112, 21234, 2132, 2292 (? ), 2475, 2496, 2859. -, -, -, instructions for, 1999 (3). Lanvalleius, Wm. de (temp. Hen. II. ), g. 2964 (67). Laon, in France, bp. 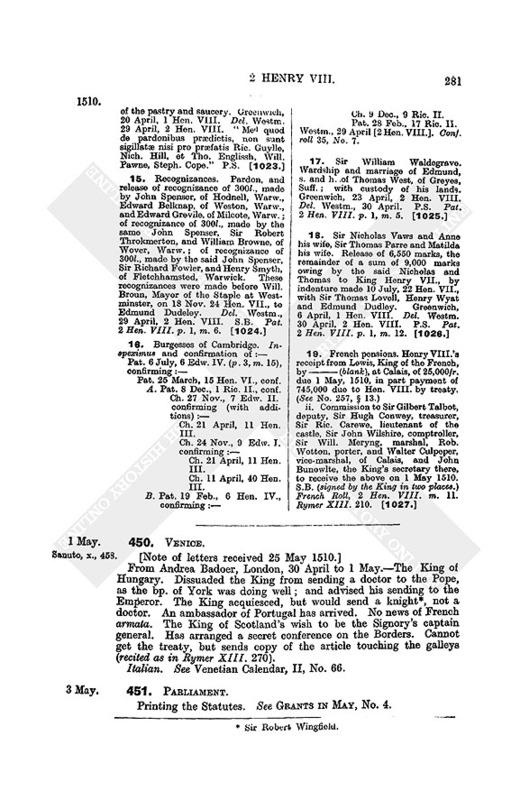 (and duke) of, 3417 (p. 1437). -, -, Premonstratene abbey, g. 1365 (2). La Palice (La Palize), in France, letter dated at, 860. La Palice (Palisse, Palysa, Palisia, Belitza, La Pallyce), Jacques de Chabannes Sieur de, Great Master of France, 1301 (p. 598), 1359, 1509, 1511, 1575 (pp. 721, 723), 1591, 1647 (p. 743), 1689 (p. 774), 1980, 2038, 2170, 2173 (3), 2198, 2204, 2237, 2254 ii., 2299, 2379, 2681 ii., 3240, 3247, 3348, 3364. La Perriere, seigneurie of, 3210, 3380. La Peyon, Jenan de, French prisoner, 2227. Lapfflode or Laplode, John, 438 (4 m. 20). Lapostole, Peter, of the Council of Mechlin, 1721. Lapworth, Warw., 438 (2 m. 11). Larbre, Thomas, canon of St. Stephen's, 3142. Larder (Ladder), Edmond, 438 (2 m. 15), 1502:p. 1536:g. 833 (58 iv. ), 3582 (15). La Rea (Ree), Glouc. [in Hempsted], g. 2861 (29). La Rea, Peter de, Spanish ship master, g. 546 (18), 924 (3). Laredo (Allaredy), in Spain, 1326 (p. 618), 1459. Larkbeare, Devon, g. 1083 (2). Larke, Peter, g. 3499 (39). -, -, Thomas, King's chaplain, canon of St. Stephen's, g. 969 (50). -, -, Wm., 707 (p. 383). -, -, Wm., clk., 3529. La Roche (Rochefort), Sieur de. See Plaine, G. de. La Rocque or La Roche, Pierre de, French prisoner, 2053 (p. 928), 2172. La Ryve, Jean de, French prisoner, 2172:p. 928. Lasborough (Lasborowe), Glouc., 438 (4 m. 3). La Scala. See Castel della Scala. Lascarina, Isabella, a Greek, g. 750 (4). Lascaris, John, French ambassador at Venice (in 1508), 1552. Lask, Ric., a Scot, 1262 (p. 578). Lassell, Margaret, 438 (1 m. 12). Lassells (Lassellys), Ric., g. 804 (29 ii. ), 833 (50 ii). -, - (Lassels, Lassellys), Roger, 438 (1 m. 1). Lasswade (Leswaide), in Scotland, 1136. Lastarrinea, Helena, of Corinth, countess of Sarrinalle, g. 357 (23). La Stella, in Italy, 1102. Latchley (Laccheley), Essex, g. 94 (35 p. 50). 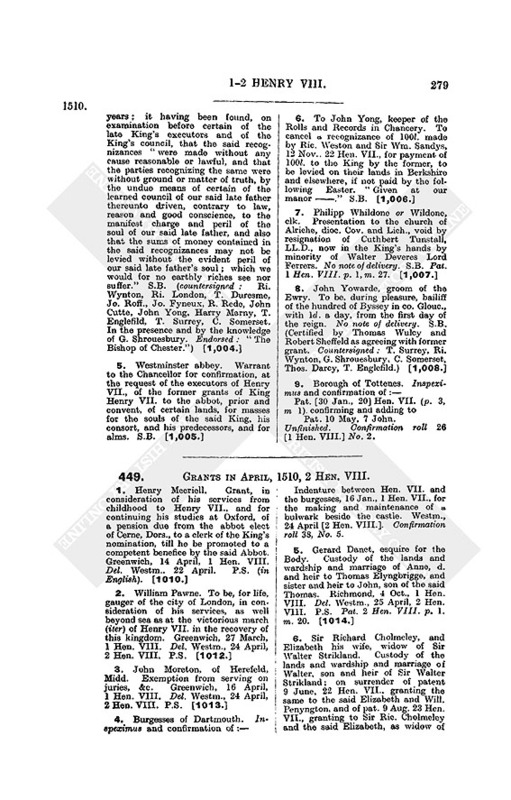 Lathbury (Lathebury), Richard, clerk of the Council in Calais, 193 (p. 101):g. 604 (47). -, -, Wm., serjeant of the Hall, 20 (p. 18), 82 (p. 40):g. 449 (14). Lathern, Wm., 1803 (2 m. 4). Lathom (Lathoum), Lanc., 438 (1 m. 17), 438 (2 mm. 4, 6), 438 (4 mm. 8, 16). Lathom (Laathum, Latham, Alathom), Ralph, goldsmith, 438 (1 m. 6):g. 94 (32), 1083 (24). -, - (Alathom), Robert, 438 (2 m. 18). -, - (Lathum), Th., g. 3107 (14). Latimer (Latemer, Latamer), Richard Nevill lord, 37, 205, 438 (4 m. 21), 442, 963, 2239, 3464:pp. 1546, 1547 ter:g. 784 (42), 804 (29 iv.vi., ix.xi. ), 833 (45 iii., 50 iii., iv. ), 1365 (3), 2222 (16 Yorks), 3408 (16, 37). -, -, -, his son and heir, App. 26. -, -, John, justice of assizes, g. 3107 (55). -, -, Wm., g. 2055 (95). La Tremouille (Trimouille, Trimolia, Tremoyle, Latrymoll), Charles de, governor of Burgundy, 406, 432, 538, 1081, 1141, 1237, 1265, 1647, 1854, 1973, 1984, 1993, 1999 (4), 2020, 2022, 20289, 2041, 2056, 2074, 2079, 2095, 2144, 2198, 2259, 2307, 2332, 2410, 3348, 3364, 3411, 3424, 3430. -, -, -, his two sons, 1984. -, -, -, letter from, 1237 ii. -, -, Francis de la, prince de Talmond, son of Charles, 3348. Latryne, Jean de, French prisoner, p. 928. Latton, Essex, g. 604 (36). Latton (Letton, Lytton), Wilts, 438 (1 m. 25). Laude, Paul de, secretary of Andrea da Borgo and the Duke of Milan, letters from, 1228, 1240, 1863, 1888, 2233, 2245, 2261, 2271, 22812, 2296, 2309, 2351, 2372. -, -, -, other references, 1278, 1309, 1311 (p. 602), 2183, 2270. Lauder (Lowder), Sir Alex. and Sir George, slain at Flodden, 2313n. -, - (Lawder), Sir Robert, of the Bass, 1499:g. 448 (1), 833 (65), 1602 (27), 2862 (8). Lauffen, in Bavaria, letter dated at, 2650. Laughton (Laghton), Linc., 1803 (2 m. 3). Laughton (Laghton), Suss., 438 (3 m. 9):g. 709 (2). Laughton en le Morthen (Laghton in Moruyng), Yorks, 438 (2 m. 5). Launcelyn, J. Benedicta, daughter of John, 438 (2 m. 22). Launcells, Cornw., 438 (4 m. 26). Launcelot, Sir, of the Order of St. John, g. 1836 (3). -, -, Francis, p. 1517. Launceston (Lanceston), alias Dunhevid (Downevet, Dounhevedburgh), Cornw., 438 (2 mm. 16, 21), 438 (3 mm. 11, 23), 438 (4 mm. 16, 23, 27). -, -, castle, g. 94 (86). -, -, priory, 438 (2 m. 21), 438 (3 m. 13). -, -, -, prior of, 1493. See Cralian, J.
Launde priory, Leic., 438 (3 m. 18). -, -, prior. 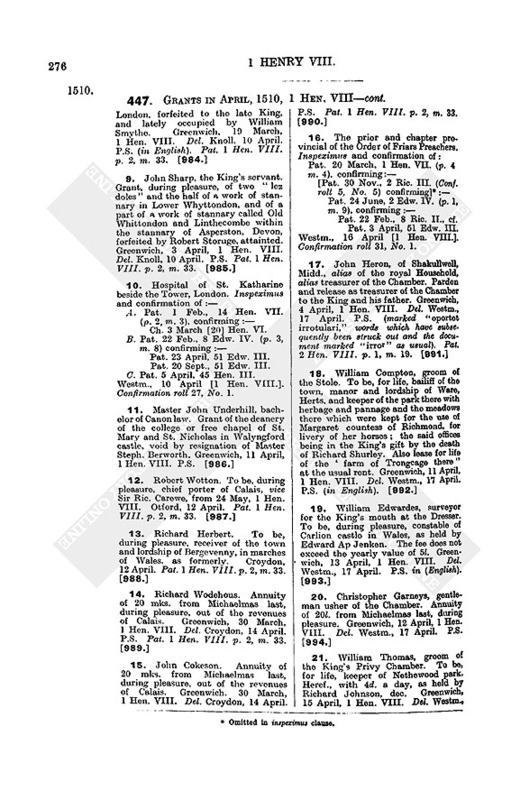 See Lancaster, J.
Launder, Wm., chaplain, g. 682 (29). Laurence, groom of Katharine of Aragon, 20 (p. 15). Laurencekirk (Convet, Convecht), in Scotland, pp. 1523, 1526. Lauston (Laweston, Laueston), Henry, 438 (1 m. 6). Lautrec (Lawter, Utrech, Lotrech), Odet de Foix, seigneur de, 1301 (p. 598), 1611, 1689 (p. 774), 1695, 1736, 1937, 2079, 2242, 2561, 3348, 3364. -, -, -, commission to, 1611. Lauweryn, Jerome, lord of Watrevliet, 2366 (2). Laval, M. de, 1825, 3349 (p. 1412). Lavell, John, g. 546 (21). Lavender (Lavander), Wm., 438 (1 m. 12). Lavenham (Laneham, Lanam, Lamenham), Suff., 438 (3 mm. 9, 17, 32), 438 (4 mm. 23, 26), 1803 (1 m. 1). Laventon (Lawnden), Bucks, abbey, 438 (2 m. 31). -, -, -, abbot. See Hall, W.
Laver, High-, Essex, g. 289 (16). Laver, Little-, Essex, g. 289 (16). Laver Mawdelyn (L. Maydeleyn), Essex, g. 289 (16). La Verderne, Charles de, ordinary secretary of Margaret of Savoy, 1344. La Vernade, Pierre de, master of requests of France, 2322. Laversdale, Cumb. (Loversdale, Cornw. ), [in Irthington], 1803 (1 m. 2). Laverstock (Laverstoke), Hants, 1493 v.
Laverstock (Larstokke), Wilts, 438 (2 m. 30). La Vienne, Bart. de. See Alviano. La Viridea, Charles de, secretary or audienciary to Margaret of Savoy, 2255. La War, Lord. See Delaware. Lawden, John, purser, pp. 1499, 15002. Lawderdale, in Scotland, lord of, 188n. Lawe, John, 438 (3 m. 25). Lawes (Lawe), Cuthbert, 438 (2 m. 24). Lawford or Church Lawford (Lalford, Lalleford), Warw., 438 (1 m. 8), 438 (2 m. 14), 438 (3 m. 5), 438 (4 m. 17). 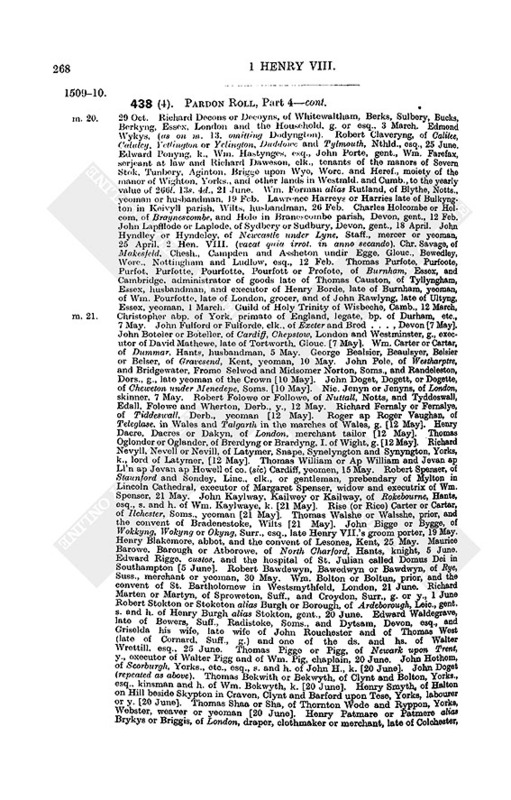 Lawford Parva, Warw., 1803 (2 m. 3). Lawnder (Lavynder), Wm., 1803 (2 m. 5). Lawnell, Roger, 438 (1 m. 9). Lawnselyn, Alice and Wm., g. 2772 (57). Lawrence or Laurence (Laurens), Henry, 1493 ii. -, - (Lawrens, Lorans), John, 438 (1 m. 6), 438 (3 mm. 9, 26). -, - (Laurance), John, esquire for the Body, 20 (p. 16). -, -, John, rector of Fonthill Gifford, 853. -, - (Larrance), Ric., 438 (1 m. 26), 438 (4 m. 7):g. 632 (70), 833 (4), 1415 (8). -, - (Lawrense), Rob., 438 (1 m. 13). -, -, Stephen, p. 1505. -, -, Wm., a Scot, g. 1948 (14). Lawshall (Laushull), Suff., rector of, 438 (3 m. 25). Lawson (Lauson), George, 2651, 27089, 2713, 3359:p. 1507. -, -, -, signature of, 3359. -, - (Lauson), Gilbert, 438 (4 m. 12). -, - (Laweson), James, 438 (4 m. 26). -, -, John, of Leith, 1380. -, - (Lauson), Wm., 438 (3 m. 31). Lawter, Mons. de. See Lautrec. Lawter, Lawtor or Lawtur, Godfrey, 20 (p. 17), 438 (1 m. 19). Lawton, Chesh., g. 2684 (45). Lawton (Hawton, Launton, Lauton), John, rector of Astbury, 438 (4 m. 18). Laxton, Notts, 438 (1 m. 26). Layburne (Leyborne, Leynborne), Kent, rectory of, pp. 1526, 1528. Layburn (Laiborn), Rob., 1493 iii. -, - (Laybourne, Layborn), Th., 438 (4 m. 8). Laycock (Lacok), Wilts, 438 (2 m. 22):g. 924 (29). Layer (Layre) de la Hay, Essex, 1803 (1 m. 6). Layer Marney (Leyre Marney), Essex, 438 (3 m. 19). Layham (Leyham, Leigham), Suff. [in Clare], g. 94 (35 p. 50), 1083 (32). Lazarus, a copyist of Erasmus, 2133. Lea, the Essex river, g. 969 (45). Lea (Lee, Leygh, Be, Bye, Legh), Derb., 438 (2 mm. 8, 17 bis), 438 (3 m. 3). Lea (Lee), Linc., 438 (3 m. 13), 438 (4 mm. 3, 16). Lea (Ley) Marston, Warw., 438 (3 m. 25). Leachlade (Lichelad), Glouc., g. 94 (35). Lead, export of, g. 132 (91), 563 (13), 604 (12), 632 (68), 1170 (11), 1415 (17), 1494 (13, 21), 1662 (22), 3107 (2, 14, 53). -, -, staple of, g. 132 (30), 381 (26). -, - See also Ordnance. Lead (Ledehall), Yorks, 438 (3 m. 12). Leafield (Feelde in Whichewode), Oxon, g. 1365 (17). Leake (Leek), Linc., 438 (4 m. 23):g. 2964 (45). -, -, rector of, 438 (1 m. 10). 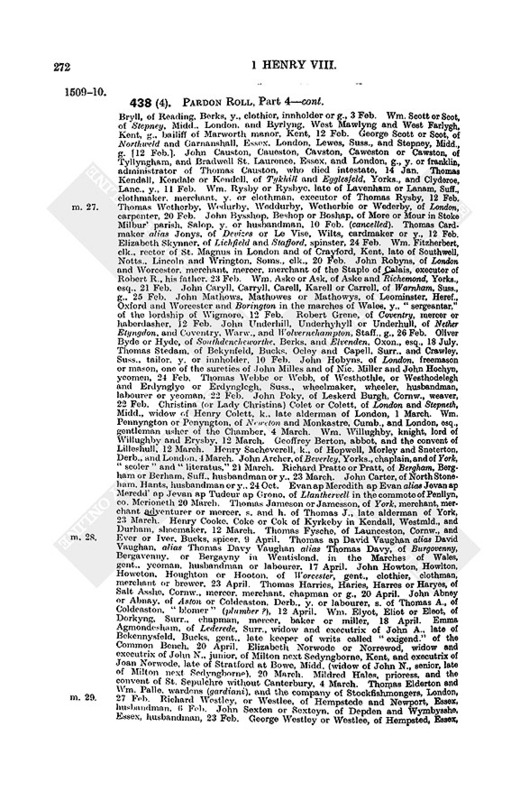 Leam (Leme, Overleme, Netherleme), Nthld., 1803 (1 m. 1). Leamington (Lenyngton), Warw., 438 (2 m. 27). Leather, hides, &c., 193:g. 1415 (17), 1494 (13), 1602 (31), 2772 (49), 3107 (2, 14), 3226 (14). -, -, buying of (Act), 2590 (17). -, -, export of, g. 132 (91), 563 (13), 604 (12), 1662 (22). Leatherhead (Letherhed, Lederede), Surr., 361, 438 (4 m. 28). Leathermakers, 438 (3 m. 4). Leather sellers, g. 158 (50), 604 (28), 2055 (31), 3499 (11). Leawood (Wode, Leytwode), Devon [in Bridestowe], 438 (2 m. 11). Le Bascle, Guillaume, of Britanny, 3349 (p. 1412). Le Bras, Michelet, of Havre, 211. Le Brasseur,, 2414 (p. 1072). Le Charon, Denis, French gunner, 1265 (p. 580), 2083 (2). Leche, Alexander, chaplain, a Scot, g. 1415 (20). -, - (Leych), John, 2392 (p. 1063). -, -, John, clk., g. 1732 (4). -, -, John, vicar of Chipping Walden, g. 2772 (57). -, -, Martin, 438 (3 m. 30). -, - (Leych, Lech), Ralph, 2392 (p. 1063), 2832 v., vi.:g. 651 (7). -, - (Leych), Ric., 2392 (p. 1063):g. 1494 (8). -, -, Th., 438 (1 m. 23). -, -, Wm., 1262 (p. 578). Lechedesham, Hants, g. 2964 (67). Leckhampton (Lekehampton, Lechehampton), Glouc., 438 (3 m. 2). Leckhampstead (Leycamstede), Bucks, g. 1462 (37). Leckonfield (Lekynfeld, Lekingfeld), Yorks, 438 (2 mm. 9, 13, 17), 438 (3 m. 25), 1803 (2 m. 2):g. 833 (23). Leckwith (Liquith), co. Glamorgan, g. 749 (2). Le Clerc, Alain, 3349 (p. 1412). -, -, Daniel, receiver of the Emperor's artillery, 2205. Le Clerck, J., of Bethune, 2995. Lecriand, Lacryan or Lecryant, Wm., gunner, 20 (p. 14), 311:g. 218 (51). Lecton or Lekton. See Layton. Ledbury, Heref., 438 (3 m. 5):g. 833 (71), 3107 (26, 41). Ledington (Ludyngton), Glouc., 438 (4 m. 14). Le Doulse, Pero, the King's cook, 20 (p. 15 "Pirse"), 877n., 970, 2624, 3561. Lee, Kent, 1120:g. 1123 (51, 58), 1172 (12). Lee or Lagley, Salop, 438 (3 m. 20):g. 381 (46). Lee, in Tortington, Suss., g. 969 (38). Lee, Anne, 438 (1 m. 1), 438 (4 m. 5). -, - (Lyght, Legh, Leigh, Lygh), Ant., chief clerk of the Kitchen, 20 (p. 17), 82 (p. 39), 707, 2933:p. 1505:g. 94 (60), 257 (2), 3408 (11). -, -, Edmund, p. 1544. -, - (Legh), Fulk, 438 (3 m. 20). -, - (Legh), Giles, g. 546 (57). -, - (Lye), Henry, 853. -, - (Legh), Humphrey, g. 1732 (27). -, - (Leye), James, 1803 (2 m. 5). -, -, Joan, 438 (3 m. 23):g. 1266 (35). -, -, Joan, abbess of St. Mary's, Winchester, 438 (3 m. 31). -, - (Legh, Leygh, Lye, Ley), Sir John, 438 (4 m. 18):p. 1545:g. 257 (49), 731 (28), 833 (58 ii. ), 1948 (10), 2222 (16 Surr. ), 2484 (27), 2684 (8, 99), 3499 (12). -, - (Legh, Lye, Alye), John, 20 (p. 13), 438 (2 m. 28), 438 (3 mm. 312), 438 (4 mm. 1, 12):g. 414 (54), 1948 (19), 2222 (12). -, - (Lye), Matth., page of the Chamber, 20 (p. 15). -, - (Legh, Ley, Le), Sir Piers, 20 (p. 16), 438 (4 m. 16). -, - (Legh), Ralph, 438 (3 m. 32). -, - (Ligh, Loee), Ric., 19, 20 (p. 18), 82 (p. 40), 438 (1 m. 25), 438 (3 m. 31):p. 1539:g. 289 (43), 1266 (35), 2055 (120), 2222 (16 Kent). -, - (Lye, Ly), Richard, abbot of Shrewsbury, 205, 438 (4 m. 4), 3464:g. 1123 (55), 1221 (512). -, - (Alee), Ric., of the Jewel House, 20 (p. 18), 82 (p. 42). -, - (Alee, Legh, Le, Ley), Rob., 20 (pp. 17, 19 bis), 82 (pp. 39, 40), 438 (1 m. 1), 438 (3 m. 24), 438 (4 mm. 5, 25):g. 563 (2), 1266 (35). -, - (Legh, Leygh), Roger, p. 1545:g. 2684 (8). -, - (Legh), Th., g. 218 (32), 546 (57). -, - (Legh), Thomas, M.A., King's chaplain, g. 2422 (16). -, - (Aligh, Alye, Lye), Wm., g. 94 (93), 158 (70), 709 (56), 749 (31, 42). -, - (Legh, Legh), Wm., King's spear, 1990, 2480 (23), 2885. -, - (Alee), Wm., receiver general of Berwick lands, 746:g. 94 (55), 857 (16). 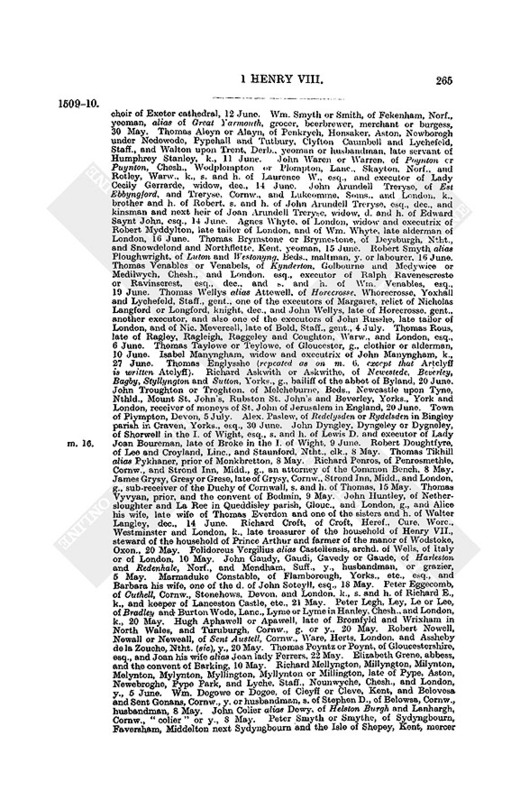 -, - (Leygh, Lye), Wm., sewer of the Chamber, 20 (p. 13), 639, 877n., 913. Leeds (Ledes), Kent, g. 833 (70). -, -, castle, g. 1524 (45). -, -, park, g. 1524 (45). -, -, priory, 438 (3 m. 11):g. 2137 (8), 3499 (55). -, -, -, confirmation for, g. 924 (30). -, -, -, prior. See Chetham, R.
Leeds (Ledys), Yorks, 438 (2 m. 14), 438 (3 m. 12), 1803 (1 m. 4). -, -, Kirkstall abbey. See under K.
Leek (Leeke, Leke), Staff., 438 (2 m. 24), 438 (3 mm. 5, 6). Leek or Leeke. See Leke. Leeming (Lemyng), Little-, Yorks, g. 2964 (44). Leeming (Lemyng), John, g. 3582 (7). Leeuwarden (Lewardia), in Friesland, letter dated at, 3455. Lefevre, Roland, Sieur de Tamise, treasurer to Prince Charles, 2070, 2528, 25634, 2849. Legate, the [in France]. See Amboise, G. d'. Legbourne (Leyghburn), Linc., 438 (4 m. 25). Legendre, Adenet, French ship captain, 1467. Legge, Warw., in Aston, 438 (4 m. 12). Legham (Lagham) manor, Surr., 643:g. 709 (26). Legnago (Lignano, Lynago), in Italy, 522, 531, 570, 2074, 3396. Le Grand, Henry, gunner, 2414 (p. 1072). Legsby (Legysbe), Linc., 438 (1 m 6). Le Gyche. See La Guiche. Le Haye, Salop. See Hay. Leicester, 102, 438 (2 m. 32), 438 (3 m. 8), 438 (4 mm. 6, 13, 26), 1803 (2 m. 5):g. 833 (11), 1221 (41), 2684 (41), 3049 (26). -, -, castle, g. 218 (12). -, -, mayor and burgesses, 438 (3 m. 16). -, -, St. Mary de Pratis abbey, 438 (3 m. 2). -, -, -, abbot. See Pexsall, R.; Penny, John. -, -, -, confirmation for, g. 414 (18). -, -, St. Mary's College (New College, Newark), 438 (1 m. 18), 438 (2 m. 8), 1803 (1 m. 2), 1803 (2 m. 3):g. 784 (27), 1524 (32), 3324 (4). -, -, -, confirmation for, g. 414 (34). -, -, -, dean. See Whistons, J.; Young, J.; Derby, T.
-, -, Wigston's hospital, g. 2137 (16), 3499 (27). Leicester, archd. of, commissary and official, 438 (1 m. 18). Leicester (Leycestre), Laurence, clk., 853. -, - (Leycestre), Peter, 438 (2 m. 4). -, -, Roger de, g. 519 (42). -, - (Leycettur), Wm., g. 3499 (68). Leicestershire, 205 (p. 106), 438 (1 m. 13), 438 (2 m. 10), 438 (3 m. 18), 849, 2392:g. 132 (26), 190 (3), 218 (55), 381 (74), 833 (11), 969 (23), 1003 (1), 1123 (15), 1462 (1), 1494 (9, 55), 1804 (22, 28 ii., 30), 1836 (6), 2222 (12, 16), 2330 (3), 2484 (9, 17), 3408 (18, 37), 3499 (12, 66, 68). -, -, commission of the peace, p. 1539. Leigh, Lanc., 438 (4 mm. 6, 16). Leigh (La Lee), Oxon, g. 485 (44). Leigh (Lee, Leght), Wilts, 1803 (1 mm. 1, 6). Leigh Durant (Leghderant), Cornw. and Devon, g. 1083 (2). Leigh upon Mendip (Lye or Lygh upon Mynydemp), Soms., 438 (3 mm. 17, 31). Leighfield (Le Feld, Lighfeld), Rutl., alias the "forest of Rutland," ranger, g. 257 (52), 632 (47). See Ratcliff, R.
Leighlin, in Ireland, archd. of, p. 1526. -, -, bp. of, 1910:p. 1528. See Maguire, N.; Halsey, T.
-, -, diocese, p. 1526. Leighs (Lyghes), or Great Leighs, Essex, priory, 438 (1 m. 9). -, -, -, prior. See Trotter, H.
Leighton (Leyghton), Beds, 438 (4 m. 9). Leighton, Hunts, g. 1805 (2). Leighton, Lanc., 438 (3 m. 10). Leighton Buzzard (L. Busard), Beds, 438 (4 m. 14). Leighton (Leghton), John, g. 1804 (4). -, -, Maud, g. 1804 (4). -, - (Leygtton), Rob., of the Guard, ship captain, 707, 1134, 1661 (3). -, -, Sir Th., knighted at Tournay, 1176, 2392:App. 26:p. 1543. -, - (Lekton, Lecton, &c.), Th., 438 (4 m. 24). Leigh wood, Wilts, g. 1171 (2). Leintwardine (Lentwardyn), Heref., 438 (2 m. 8). Leith (Lyth, Lidebourg, Let), in Scotland, 585, 1262, 13245, 1504, 1645, 1775, 2085, 2793, 2973, 3349. -, -, St. Anthony's priory, p. 1522. Leke, Eliz., widow of Andrew, 438 (2 m. 21). -, - (Leyk), Sir John, knighted at Lille, 2392:App. 26. -, - (Leeke), John, 438 (2 mm. 5, 12), 1176 (4):g. 1948 (23). -, - (Leeke), Margaret, 438 (3 m. 5). -, - (Leek, Leyk), Th., 438 (3 m. 5), 2392. Leland (Leyland, Leylond), Wm., 438 (4 m. 16):App. 26. Lelegrave, Wm., g. 1266 (6). Lemagis, Wm., g. 2684 (57). Leman, Th., vicar of Walpole, 438 (3 m. 16). Le Marcer, Olivier, g. 2861 (20). Lemington, Over-, Glouc., 438 (4 m. 3). Le More, Salop. See Moor. Lemos (Lemus), count of, of Spain, 162 (p. 85). Lempriere, Th., bailiff of Jersey, g. 257 (37). Lempston, Surr., 438 (4 m. 22). Lemyngton, Ralph, g. 784 (3). Lenard, Ric., g. 3049 (33). Lenard Stanley. See Stanley St. Leonard's. Lenborough (Letymburgh), Bucks, 438 (2 m. 8). Lench Randolff, Worc., 438 (3 m. 14). Lench, Rouse- (Rowslenche), Worc., 438 (3 m. 11). Lenche, Sheriffs- (Shiresfeslenche), Worc., g. 924 (12), 969 (32), 3226 (28). Leney, M. de. See Ligne. Lenham (Leneham), Kent, 438 (3 m. 20). Lenn or Lenne. See Lynn. Lennington (Lynyngton, Lenengton), Joan, 438 (1 m. 18). Lennox (Lenox), Matthew Stewart earl of, slain at Flodden, 255, 2246 (1, 4), 2313. -, - (Levinax), John Stewart earl of (1513), 2461, 2973. Lentalle, Th., g. 1494 (55). Lenton, Notts, priory, 438 (3 m. 6):g. 519 (18). -, -, -, prior. See Reynold, T.
Lenton, John, g. 1662 (23), 2484 (17). -, -, Nic., 20 (p. 18), 82 (p. 39), 707. LEO X, POPE [John de Medici, elected 9 March 1513], 1677, 1682, 1694, 1699, 1701, 1718, 17234, 17378, 17401, 1747, 17501, 1753, 1762, 1769, 17756, 17812, 1792, 1830, 1846, 1854, 1857, 1872, 1877, 1884, 1892, 1895, 1899, 1902, 19167, 1937, 19523, 1970, 1984, 2002, 2010, 2016, 2029, 2032, 2038, 2041, 2056, 206970, 2077, 2108, 2120, 2124, 2127, 2132, 2144, 2160, 2178, 2212, 2216, 2237, 2242, 2250, 22589, 2264, 2267, 2273, 2276, 22912, 2307, 2309, 23289, 2343, 23534, 2373, 2375, 2377, 2389, 2395, 2397, 2428, 2456, 2462, 24747, 2493, 24956, 2523 ii., 25267, 2530, 2554, 2561, 25645, 25678, 2572, 2577, 2584, 2595, 26012, 2607, 2609, 2611, 262931, 2633, 26445, 2653, 2665, 268990, 2694, 2697, 2724, 2736, 27435, 2755, 2770, 27834, 2790, 2794, 2800, 2816, 2823, 2845, 2849, 2852, 2855, 285960, 2869, 2876, 2887, 2915, 2921, 29269, 2932, 2945, 2957, 2969, 2975, 2981, 2998, 3003, 3009, 3011, 3014 ii., 3018, 3024, 3051, 3063, 3072, 3075, 30801, 3093, 31056, 3109, 3117, 3132, 31501, 3160, 3173, 3192, 3198, 32034, 3206, 3212, 3220, 3231, 3236, 3241, 3243 ii., 3245, 3253, 3256, 3261 ii., 3274, 3285, 33012, 3304, 3322, 3362, 3379, 33912, 3400, 34045, 3407, 3417 (p. 1437), 3468, 3482, 3490, 34957, 3508, 3511, 3519, 3527, 35334, 3540, 35468, 3556, 3558, 3569, 3574, 3585:p. 1516:g. 1732 (32), 1836 (3, 5), 2772 (13). -, -, bulls of, 2870, 291011, 32759, 3568, 3617:g. 3499 (8 ii.). -, 251213, 2517, 2559, 2560, 2636, 263941, 265860, 2664, 2688, 27601, 2802, 28202, 291620, 2978, 29868, 2990, 30057, 3016, 301921, 3083, 3092, 3125, 3128, 31578, 3164, 3205, 3242, 3249, 32545, 3284, 3300, 3305, 331112, 3358, 34012, 3462, 3470, 3475, 3487, 3532, 3563, 3617. -, -, letters to, 1707, 1719, 17567, 1974, 2084, 2310, 2355, 2420, 24367, 254853, 2674, 2715, 2884, 311920, 313940, 3390, 3489, 35889. -, -, English and Imperial embassies to do fealty, 2010. -, -, sending legates to France and England, 2064, 2077, 2353, 2436, 2611. -, -, league with the Swiss, 2771. -, -, his oath to (or capitulation with) the Conclave, 1677 (p. 770n. ), 2517. -, -, Regesta of, pp. 152732. -, -, treaty (secret) with Ferdinand, 3291. Leodo, Sieur de, of Guienne, 1344. Leominster (Lemyster), Heref., 438 (2 m. 8), 438 (3 mm. 20, 26), 438 (4 mm. 25, 27). Leominster (Lymyster), Suss., g. 969 (38). Leon, in Spain, 3435, 3451. Leonino, Angelo, bp. of Tivoli, q.v. Leppington (Lepyngton), Th., 438 (3 m. 22). Lepyngton, Wm., 438 (2 m. 7). Le Rendnal, Jean, French prisoner, p. 928. Le Roy, Guyon, Sieur de Chillou, q.v. Le Roye, Francis, g. 3408 (26). Le Sauvage, John, Sieur de Schaubeke, chancellor of Brabant, 919, 2366 (2), 2985. Lescorno, Don Juan de, admiral of the Spanish fleet, 1385. Leskard or Leskerd. See Liskeard. -, -, Thomas, chaplain, 2480 (4), 3535. -, -, Thomas, canon of Shrewsbury, p. 1527. -, -, Thomas, rector of Bentham, g. 1123 (28). -, -, Thomas, rector of Ewelme, g. 2055 (97). -, - (Lesons), Thomas, rector of Tettenhall, p. 1525:g. 563 (4). L'Esparre (Lespar), Sieur de, 3348. Lessingham (Lesyngham), Geoffrey, rector of St. Edmond's, Norwich, 438 (4 m. 5). Lessness (Lesones), Kent, abbey, 438 (4 m. 21). -, -, abbot of. See Blakemore, H.; Tiseherste, W.
-, -, election of abbot, g. 1732 (30, 51). Le Strange, Richard lord (13981449), and Eliz. his wife, 438 (3 m. 10). Le Strange (Straunge), Anne, widow of Thomas, 438 (3 m. 11). -, -, Sir George Stanley lord, 438 (3 m. 14). -, -, Joan lady, d. and h. of John lord Le Strange (14491477), and widow of Sir George Stanley(1487), 309, 438 (3 m. 10):g. 3107 (40), 3499 (72). -, - (Straunge), John, 438 (1 m. 2):pp. 15401:g. 381 (43), 833 (58 i.). -, -, Rob., 20 (p. 16), 438 (1 m. 1), 438 (3 m. 11), 1176 (4):g. 11 (10), 833 (50 i.). -, -, Sir Roger, 438 (1 m. 2):g. 218 (37). Letcombe Basset (L. Fasset), Berks, g. 885 (13). 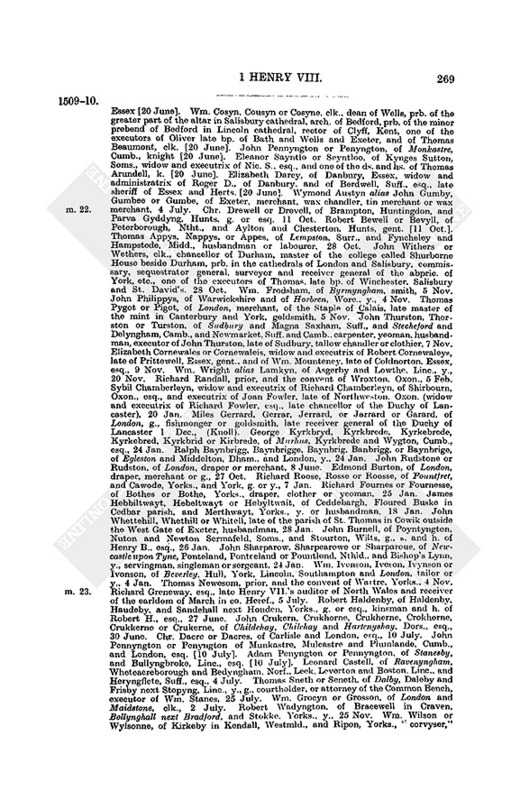 Letheringham (Lethringham, Leddringham), Suff., 438 (3 m. 22), 438 (4 mm. 1, 29). Letley. See Litley; also Netley. Letton, Heref., 438 (2 m. 26). Letyre, Francis, falconer, 20 (p. 14), 82 (p. 43). Leuarnac, St. John's by. See Killone. Leulinghen (Lullingham), in Picardy, 2392. Leuroux, seigneurie, in France, 951. Leuykyr, near Wilberfoss, g. 158 (32). Le Veau, Jean, secretary of Andrea da Borgo, letters from, 983, 1000, 1055, 1064, 1075, 1087, 1090, 1877. -, -, -, letter from, 1877. Leven, Yorks, 438 (2 m. 20). Leven's (Levyns), Westmld., 438 (1 m. 14). Leventhorpe (Lenthorpe), Dorothy, 1165 (2). -, -, John, 20 (p. 12), 438 (4 m. 2):p. 1538:g. 257 (49), 289 (3). -, -, Th., 438 (1 m. 11). Lever, Yevan, a Breton, g. 1462 (28). Leveret, Henry and Simon (2 m. 24). Leversage, Ant., g. 158 (41). -, -, Edm., 438 (4 m. 3):g. 158 (41), 357 (34). -, -, Eleanor, widow of Edmond, 438 (2 m. 18). -, -, Rob., g. 357 (34). Leverton, Linc., 438 (4 m. 23). Levesey (Lovesey), Edm., 20 (p. 17), 82 (p. 39):g. 158 (42). -, -, George, 735, 877n. Leveson, Nic., g. 2684 (6). Levet, John, g. 2862 (7). Levetot, John de, g. 519 (42). Le Vise or Le Vises. See Devizes. Levisham (Levesham), Yorks, 438 (2 m. 17). Lew, Devon. See North Lew. Lewer or Leweb, Suss., 438 (2 m. 25). Lewes (Lewys), Suss., 438 (2 m. 23), 438 (4 m. 26), 559:g. 381 (88), 546 (41). -, -, priory, 438 (4 m. 4). -, -, -, confirmation for, g. 632 (38). -, -, -, prior of. See Ashton, J.
Lewes, archdeacon of, 438 (2 m. 26), 438 (4 m. 18). Lewis, a ship captain. See Southern. Lewis or Lewes, Chr., 2668:pp. 1509, 1515. -, -, Geoffrey, 438 (4 m. 19). -, -, Griffith, rector of Old Radnor, g. 1083 (42). -, -, Hugh, 438 (2 m. 9). -, -, Hugh, rector of Llanfihangell, g. 485 (60). -, -, John, 20 (p. 15), 457, 704. -, -, Sir Ric., 20 (p. 12), 1453, 1661 (3, 4). -, -, Rob., mayor of Canterbury (A.D. 1530), 1527. Lewisham (Levesham, Leuesham), Kent, g. 1221 (15), 2422 (7). Lewisham (Levsham), Rob., 20 (p. 18), 82 (p. 40). Lewkenor (Lewknour), Edw., 20 (p. 16), 82 (p. 39), 184 (2), 559, 577 (3), 874 (2), 3313 (6, 7):p. 1545:g. 257 (49), 632 (26). -, -, Francis, g. 969 (38). -, -, John, 559 (p. 327). -, - (Leukemore, Lewekemore), Sir Roger, 438 (4 m. 7), 1661 (3, 4 p. 752):p. 1545:g. 969 (23), 1083 (39). -, -, Roger, 559:p. 1545:g. 709 (26). Lewknor (Lewkenor), Oxon, 520:g. 546 (27), 632 (64). Lewys, Hakenett de, minstrel, 20 (p. 13). Ley (Leey), Salop, 438 (4 m. 9). Ley (Loy, La Hay), Simon de, Breton killed at Brest, 1371, 1385, 1403. Leyden (Leyen), in Holland, 2613, 2809. Leyff, Robert, rector of Stansted Thele, p. 1528. Leyland or Leylond. See Leland. Leyre Marny. See Layer Marney. Leysola, Charron de, g. 1948 (47). Liberate, writs of, g. 218 (60). -, to acquire in mortmain, g. 158 (245, 27), 414 (13), 485 (34), 519 (13, 39), 546 (30), 604 (20), 784 (10), 804 (20, 31), 969 (24, 43, 65), 1123 (11), 1415 (19, 27), 1662 (34), 1732 (4, 26, 28), 1804 (25), 2055 (57), 2137 (7, 8), 2222 (1), 2330 (4), 2684 (69, 81), 3226 (5), 3408 (39), 3499 (27, 55). -, - See also below Licences to found chantries. -, to alienate, g. 54 (47), 381 (16), 632 (18), 784 (22), 833 (41), 969 (3), 1221 (43), 1462 (27), 1494 (16), 1662 (234), 1948 (26), 2055 (73), 3049 (20), 3107 (19). -, to appropriate, g. 1221 (40), 1266 (22), 1365 (4), 3499 (50). -, to change the name of priory to that of abbey, g. 833 (64). -, to cut wood in forests, g. 1221 (36). -, to elect, g. 54 (6), 94 (46, 106), 218 (36, 40), 289 (27, 47), 381 (11), 485 (52), 546 (40), 1044 (22), 1123 (55), 1365 (10, 13), 1662 (30, 51), 1732 (50), 2535 (20, 24), 2684 (25), 2861 (17), 2863 (1), 3107 (50), 3408 (28). -, to export, g. 3226 (29). See Wool, Tin, Cloth, Leather, Lead. -, to found chantries, &c., g. 381 (69), 519 (39), 546 (75), 784 (3, 27), 833 (16), 857 (21), 924 (18), 1044 (12), 1316 (11), 1494 (46), 1524 (35), 1804 (40), 2055 (51, 534), 2137 (16), 2772 (61), 2964 (56), 3226 (3), 3324 (20), 3408 (29). -, to found guilds, g. 632 (43), 924 (35), 1732 (39), 2772 (57), 2964 (9, 56, 59, 70), 3582 (25). -, to gather alms, g. 357 (23), 632 (3), 750 (4), 833 (54), 924 (2), 1083 (19), 2862 (4). -, to go abroad for study, g. 257 (26). -, to impark, g. 414 (30), 546 (38), 804 (8), 833 (5, 51), 969 (59), 1494 (28), 1804 (20), 2684 (78), 3499 (73). -, to import, g. 1948 (37), 2861 (20), 2964 (48), 3049 (5), 3107 (2, 12, 27), 3226 (14, 29), 3582 (13). See also under Wine; also Woad, Silk, Cloth (linen), Caps. -, to practise medicine, g. 3582 (19). -, to retain apprentices, g. 1948 (71). -, to retain customs, g. 1948 (46), 2684 (52), 3107 (44, 49), 3226 (18, 20), 3408 (8). -, to trade (aliens), g. 1221 (32), 1462 (9, 28), 2055 (91), 2684 (60). See also Safe conducts. -, to trade in Ireland, g. 2861 (31). Lichfield (Lychefeld, Lyche), Staff., 438 (1 m. 9), 438 (2 mm. 6, 24, 26, 29), 438 (3 m. 3), 438 (4 mm. 15 bis, 16, 27), 1803 (1 m. 1, 2 m. 4):g. 11 (10), 709 (22). -, -, cathedral, 438 (4 m. 6), 1803 (1 m. 1):p. 1528:g. 2055 (54). -, -, -, canons of, p. 15234. -, -, -, chancellor, 853. -, -, -, dean. See Yotton, J.
Lichfield (Lychefeild), Clement, abbot of Evesham (Jan. 1514), p. 1546:g. 2684 (22). -, - (Lichefeld), John, clk., g. 1524 (21). -, - (Lycchefeld), Th., 1803 (2 m. 5):g. 1662 (23). -, - (Lychefeld), Wm., King's chaplain, 20 (p. 14), 341, 1450. -, -, Wm., clk., dean of Tamworth, g. 1524 (21). Lichtenstein (Lyttsteyne), Sir Paul, ruler of the Tyrol, 780. Licques (Lysk), in Picardy, 2392. Liddel (Liddall), the Border river, p. 1260. Liddell, Cumb., g. 2684 (86). Liddisdale (Lidesdale, Ledesdale), in Scotland, 1504, 2443. Lige (Lwke, Luke), 1311 (p. 602), 1400, 1421, 1440, 1594, 1813, 2068, 2083, 2254 ii., 2360, 2532, 2957. -, -, French prisoners taken in, 1421. Lige (Lwke), [Everard de la Marck] bp. of, and of Chartres, 1399, 1400, 1440, 2063, 2069, 2083, 3269 (3), 3407n. Lierville, Franois de Theligny sieur de, seneschal of Rouergue, 2186. Lifton (Lyston), Devon, 1803 (2 m. 5):g. 132 (115), 289 (5). -, -, rector presented, g. 158 (51), 2055 (27). Ligh lands, near Tortington, Suss., 559. -, - (Lyzghtfote), Edw., 1529. -, -, Humphrey, p. 1509. Lighthorn, Warw., g. 158 (36), 709 (41, 43). Ligne (Ligny, Leny, Lynye, Lynny, Leney), Anthony comte de Faulconberg, Sieur de, 17923, 1909, 1918, 1932, 1934, 2025, 2095 (? "Guigne"), 2128, 2139, 2225, 2249, 2383, 2388, 2391 (pp. 105960), 2392 (p. 1063), 2414, 2656, 2835, 2878, 2995, 3113. -, -, -, letters from, 1793, 3474. -, -, -, letter to, 2878. -, -, -, commission to, 1934. 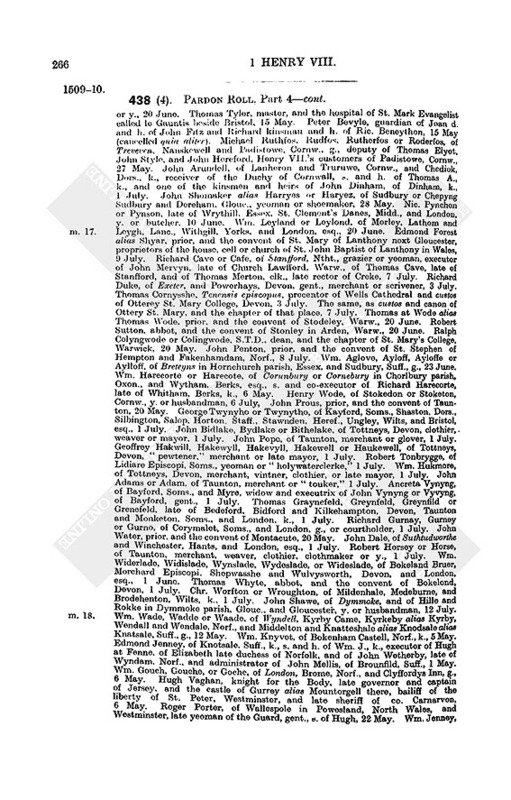 -, -, -, petition of, 2249. -, -, -, signature, 1932. -, -, -, his mitre d'hotel, 1934. -, -, -, his titles, 2414. Ligne, Louis de. See Barbanon. Likerke,, maid of honor to Margaret of Savoy, 3041. Lilburn, West-, Nthld., 438 (2 m. 19). Lille, Mons. de. See Brandon, C. (lord Lisle). Lille (Lisle), in Flanders, 1387, 2053 (6 iii. ), 2202, 22556, 2294 (2), 2372, 23756, 2380, 2391 (pp. 10601), 2392, 2445, 2542, 2572, 2577, 2678, 2682, 2736, 27445, 2777, 2811, 2941, 3041, 3139, 3163, 32578, 3264:App. 26. -, -, letters dated at, 2180, 2203, 2225, 2230, 2261, 2271, 2281, 2286, 2366, 2374, 2377. -, -, "the canon of," 2694, 3235. -, -, Friars Observants, 2375. Lilleshall (Lilleshull), Salop, abbey, 438 (4 m. 27). -, -, -, abbot. See Barton, G.
Lillingston (Lullingston), Bucks, 438 (2 m. 5):g. 357 (3, 45), 1316 (15). Lillingston (Lullyngston) Dancy, Oxon. See Lillington Lovell. Lillingston Dayrell, Bucks, 438 (4 m. 10). Lillingston Lovell alias L. Dauncy, Oxon (but within Bucks), 438 (1 m. 7), 438 (2 m. 6), 438 (3 m. 25):g. 1316 (15), 1462 (37). Lillington (Lelytyn, Leliten, Lylytyn), Warw., 438 (2 m. 9), 1803 (1 m. 6). Lilly or Lylle, John, 20 (p. 18), 82 (p. 40). -, -, Wm., 1803 (1 m. 4). -, - (Lily), Wm., schoolmaster, 2419. Limber Magna, Linc., 438 (3 m. 12). Limbury (Limbere, Limbery), Ric., 438 (4 m. 3). Limena (Lymisne), near Padua, letter dated at, 196. Limerick in Ireland, confirmation of charters, g. 546 (69). -, -, licence for, g. 1948 (37). -, -, cathedral, canons of, p. 1530 bis. -, -, -, dean of, pp. 1522, 1524, 1530. -, -, -, treasurer of, p. 1530. Limerick diocese, pp. 1522, 1524. Linacre, John, 438 (4 m. 4). -, - (Lynakre, Lynakur, Lynacres), Robert, 438 (4 m. 4), 2392 (p. 1063). -, - (Lynakyer, Lenakre), Th., 438 (3 m. 6), 736, 771, 863, 882, 891, 920, 949, 968, 1082, 2519, 2656 (6). Linby (Lyndeby, Lymby), Notts, 438 (1 m. 6):g. 751 (3), 833 (55), 2684 (1). Lincluden (Linclowden, Kenclodin) provostry, in Scotland, 1135:p. 1527. Lincoll, Wm., g. 749 (38). Lincoln, 144, 205 (p. 106), 438 (1 mm. 4, 5, 16), 438 (2 mm. 256), 438 (3 m. 20), 438 (4 mm. 18, 22, 25, 27), 872, 1798:g. 357 (6), 833 (11, 71), 1123 (2), 1316 (3), 2222 (16). -, -, deed dated at, 575. -, -, mayor and citizens of, 438 (3 m. 8), 872:g. 357 (6). -, -, weavers, confirmation of charters, g. 1123 (42). -, Beamount and Beamounts Rents, g. 2684 (2). -, Cathedral, 438 (1 m. 15), 438 (2 m. 6), 438 (3 m. 8), 1803 (1 m. 4), 3142:g. 651 (11), 2772 (29). -, -, chantry of Duchess of Lancaster and Countess of Westmoreland, g. 651 (11). -, -, dean of. See Wolsey, T.
-, -, lease by the vicars, 575. -, -, Richard Ravenser's chantry, g. 924 (26). -, -, subdean of, 438 (3 m. 3). -, -, treasurer, 438 (1 m. 10), 438 (2 m. 14). -, Close, 438 (1 m. 10). -, College of Sir Nicholas and Joan Cantelupe, 438 (1 m. 10). -, Hangate, g. 2684 (2). -, Hospital of Holy Innocents of Malardry, 438 (2 m. 11). -, St. Katharine's priory, 438 (2 m. 6), 438 (3 m. 15). -, -, prior. See Johnson, R.
Lincoln, archdeacon of, 438 (1 m. 15). -, -, bishop of, 438 (1 m. 11), 438 (3 m. 25), 438 (4 m. 14), 2629, 2635, 2642, 2644, 2653, 2660, 2783, 3197, 3275, 33012, 3315, 34957, 3560:pp. 1527, 1531. See Smith, W., Wolsey, T., Atwater, W.
-, -, bishopric and diocese of, g. 857 (18), 2772 (13, 29), 3499 (9). -, -, -, consistory of, 438 (1 m. 18). Lincoln, John de la Pole earl of (1487), g. 546 (43), 632 (66), 709 (14), 1083 (23), 1662 (11), 1948 (31), 2055 (95 i., iii. ), 2617 (29), 3107 (16), 3499 (58). Lincoln, John, 438 (3 m. 4). Lincoln, Sir [i.e., the bp. of Lincoln]. See Wolsey, T.
Lincolnshire, 205 (p. 106), 559, 1798, 2054 (3), 2414, 2544:p. 1516:g. 132 (59), 158 (63, 76), 190 (3), 218 (55), 257 (48), 381 (74), 604 (31), 632 (26), 651 (13), 709 (55), 749 (6), 804 (21, 38), 833 (11), 969 (23, 52, 54), 1003 (1), 1123 (15), 1365 (24), 1462 (1), 1494 (9, 55), 1524 (30), 1804 (22), 2055 (43), 2222 (12, 16), 2330 (3), 2484 (9, 17), 2684 (20), 3408 (6, 18, 37), 3499 (12, 16), 3582 (14). -, -, commission of the peace, pp. 153940. -, -, Richmond fee in, g. 132 (56, 88). -, -, wards' lands in, g. 158 (63). Lindores (Lundoris), Henry abbot of, 2461. Lindsay, Alex., earl of Crawford, q.v. -, -, Patrick lord, of the Byris, g. 2862 (8). Lindsey, part of Lincolnshire, p. 1540:g. 357 (6). Lindsey (Linsey, Lyndesey), John, 20 (p. 18), 82 (p. 40), 707 (p. 383):g. 2772 (26). -, - (Lyndesey), Wm., abbot of St. John's, Colchester, 205, 438 (1 m. 5), 963, 3464. Linen drapers, 438 (2 m. 6). 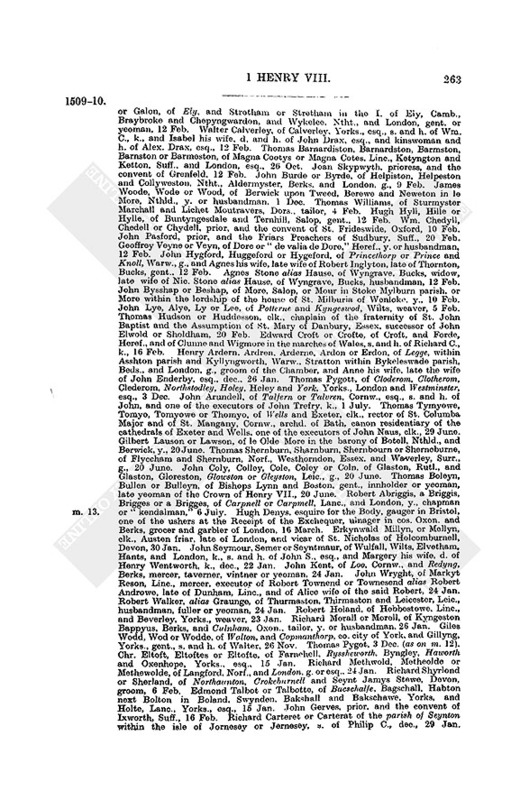 Lingen (Lyngeyn, Lyngoyn, Lyngon, Lyngham, Lyngam), Sir John, 438 (1 m 16), 1661 (p. 752):pp. 1518. 1538:g. 257 (49), 632 (26), 924 (31), 1494 (4, 9), 2484 (9), 3499 (12). -, -, Wm., 20 (p. 12):g. 519 (11), 784 (45, 49). Lingfield (Lyngesfeld, Linkfelde), Surr., 438 (4 m. 2):g. 519 (31), 709 (26). Lingwood, Norf., 438 (1 m. 14). Linkinhorne (Laukynhorne, Laukynhornee), Cornw., 1803 (2 m. 4). Linlithgow, in Scotland, 1775 (p. 810). -, -, letters dated at, 834, 1135, 1137, 1211 (2), 1212, 1539 1767. Linstead (Lynsted), Great-, Suff., 438 (3 m. 14):g. 190 (4). Linstead (Lynstede), Parva, Suff, g. 190 (4). Linton, Kent, 438 (3 m. 15). Linton (Nition), in Scotland, vicar of, pp. 1521, 1523. Linton Parva, Camb., 1803 (2 m. 1). Linton (Levynton), West-, Cumb. 1493 vi. Linton, Rob., 707 (p. 383). Lintz (Lynse, Lynce, Lins, Lynche), in Austria, 1469, 2694, 2815, 2889. -, -, letters dated at, 2753, 2755, 2790, 2794. Linwood (Lynwode), Linc., g. 519 (10), 2684 (2). Lion, Ralph, purveyor, his account, 3319. Lionia, Herveus, count of (temp. Stephen), charter of, g. 546, (35). Lippomano, Hieronimo, letters from 680, 714. -, -, Vetor, letters from, 1846 ii., 2159, 2273, 2307, 2373, 2389, 2428, 2508, 2527, 2746, 2869, 2891, 2921, 2969, 2981, 3043, 3059, 3072, 3081, 3117, 3160, 3173, 3206, 3243. -, -, -, letter to, 680. Lisbon (Lyxborne), in Portugal, 1326 (p. 618), 2265, 2801. -, -, letter dated at, 1974. -, -, earthquake at, 1751. Liskeard (Leskerd Burgh, Lascarde, Lescarde), Cornw., 438 (4 m. 6, 8, 9, 27), 1803 (2 m. 5):g. 257 (69). Lisle, in Flanders. See Lille. Lisle, Jehan de, 42, 2053 (p. 928). -, -, Ramon or Reynaud de, taken prisoner at Guinegate, 2053 (p. 928), 2172. Lisle (Lysley), Lord. See Brandon, Sir C.
Lisle, Edward Grey viscount (1491), 1803 (2 m. 2). -, - Sir John Grey viscount (1503), 2537:g. 257 (40), 1602 (12), 1662 (26), 1804 (57), 2617 (46). -, -, Elizabeth Grey viscountess, a minor, daughter and heir of Sir John, 2537, 2654 (? "the lady"), 2941 (p. 1272n):g. 257 (40), 1524 (4), 1602 (12), 1662 (26), 1804 (57), 1948 (68), 2617 (46). -, -, -, valor of her lands, 2537. -, -, Marcella viscountess, widow of Sir John. See Knyvet, Th. Lisle (Lyele), Elizabeth, Queen's chamberer, 877n, 908:g. 3226 (7). -, - (Lile), Sir Humphrey, 1493 iii., 3170:g. 11 (10), 289 (35). -, -, -, prisoner in Scotland, 2246 (1, 4). -, - (Lesley, Lysley, Lyle), Sir John, 20 (p. 17), 438 (1 mm. 9, 17), 438 (2 m. 21), 1176 (2), 1596, 2574:p. 1537:g. 833 (58 ii. ), 1221 (6), 1602 (38), 1662 (27), 2222 (16 Hants), 2861 (33), 2964 (21). -, -, John, spear of Calais, 2049. -, - (Lile), Launcelot, 438 (3 m. 4). -, - Sir Nicholas, 438 (1 mm. 9, 17). -, - (Lyle), Th., 438 (2 m. 12). -, - (Lyle, Lysley, Lyell), Walter, 438 (4 m. 6). -, - (Lysley, Lyley), Wm., 438 (2 m. 32). -, -, Sir Wm., App. 26. 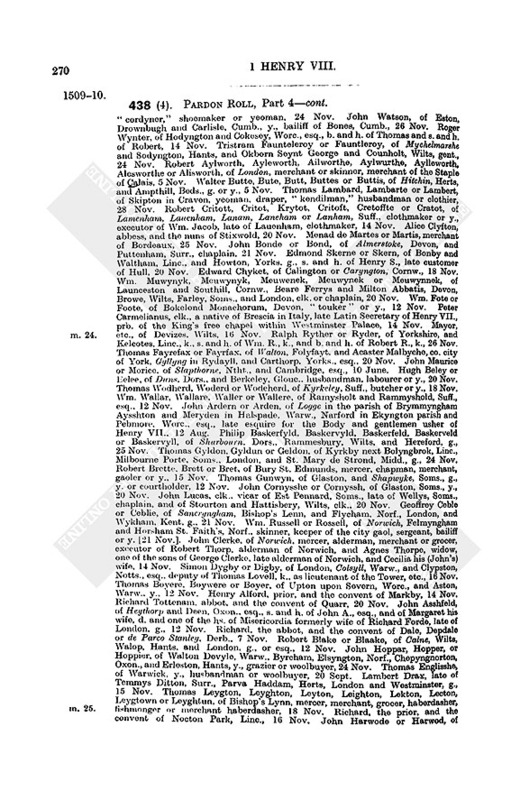 Lisleman, Comte de, 951; i.e., of the Isle of Man. Lismore, in Ireland, archdeacon of, p. 1530. -, -, diocese, p. 1524. Lismore, in Scotland, cathedral, 11512. -, -, bp. of. See Hamilton, D.; See also Argyle. Lismore, earl of. See Argyle. -, - (Lesster), Richard, 420, 550, 559, 597, 644, 728 (2), 979, 1482, 1502, 1593, 1915, 2506:p. 1520. -, -, -, letter from, 1502. -, -, -, letters to, 597, 1482, 1593. -, - (Lytster), Rob., 707. -, - (Lytster), Wm., 438 (4 m. 25):g. 2684 (20). Litchborough (Lychebarowe), Ntht., g. 1083 (41). Litcote, John, marshal of the Hall, 20 (p. 18), 82 (p. 40). Litley, Helen, g. 94 (4). -, - (Letley), John, 438 (1 m. 24). Litlington, Camb., 438 (3 m. 25):g. 731 (37). Little (Litle), Rob., g. 485 (59). -, - (Lytell, Lytull), Rob., groom of the Chamber, and Wardrobe of Beds, 20 (p. 13), 82 (p. 42), 228, 640, 912, 1015, 3554:g. 54 (85), 218 (5), 414 (14), 731 (33), 749 (40), 1170 (17). Littlebury (Litilbury), Essex, 438 (4 m. 10). Littlebury (Littulbery), Ntht., 438 (3 m. 25). Littlebury (Litilbery, Litilbury, Lytelbury), John, p. 1540:g. 804 (13), 969 (52), 1171 (3), 2222 (16 Linc. ), 3582 (14). -, - (Litelbury), Ric., g. 3499 (56). Littlecot (Lytelcote), Wilts, 438 (3 m. 1):g. 1171 (2). Littlecot (Litilcote), Alice, d. and h. of Simon, 1803 (1 m. 1). -, - (Lytyllcott, Litilcote), John, 16056, 2834, 3222. Little Dean (Litell Dene), Glouc., 438 (2 mm. 16, 23), 438 (3 m. 19). Little Frye, Nic., 438 (4 m. 8). Littlemoor (Litelmore), nunnery, Oxon, g. 2684 (69). Littleport (Litilport), Camb., 438 (1 mm. 11, 15). Littleton (Lytlyngton, Littelton), Midd., 438 (3 m. 22), 2873. Littleton or Litilton (Litilcan), Edmond, 438 (4 m. 3). -, -, Edward, 438 (1 m. 18), 2392 (p. 1063):g. 3226 (13). -, -, Hugh, 438 (1 m. 18). -, -, Joan, 438 (1 m. 18). -, - (Lytilton), John, g. 414 (12), 3226 (13). -, -, Mary, widow of Sir William, 438 (4 m. 3):g. 3226 (13). -, - (Litelton), Ric., p. 1543 bis:g. 289 (43), 2222 (16 Staff. ), 2617 (10). -, - (Lytelton), Th., p. 1546. -, - (Littilcan, Litilcan), Sir Wm., 438 (4 m. 3):g. 414 (12). Livermere (Levermer), Magna, Suff., 438 (1 m. 22). Liverpool (Lyverpull), Lanc., 438 (2 m. 25). Liversedge (Leversegge), Yorks, App. 26:g. 158 (66), 2772 (24). Livery of lands, g. 289 (12, 16, 17, 18), 357 (36), 381 (30, 89), 546 (26), 563 (145), 709 (18), 784 (26, 48), 804 (47), 833 (63), 885 (13), 924 (20, 25), 1044 (24), 1083 (31), 1221 (11, 59), 1266 (18), 1316 (1, 24, 35), 1365 (12), 1415 (12), 1494 (5, 14, 42), 1524 (27, 36), 1732 (44), 1804 (4), 2055 (18), 2137 (5), 2964 (13), 3049 (3), 3107 (23, 35), 3226 (11), 3408 (20, 23), 3499 (34, 37, 43, 72), 3582 (10, 20, 23). Livesay, Edmond, g. 969 (39). Liviano, Bart., a Venetian, dies in prison at Loches, 264. Livingstone (Levingstoun), Eliz., widow of Alex., 549. Llanaber (Llaneaber), co. Merion., 438 (3 m. 22). Llanarth (Lavarth), co. Cardigan, p. 1528. Llanbeblig (Llankeblike), co. Carnarvon, 438 (2 m. 27). Llanblethian (Lanlythan), co. Glamorgan, rector presented, g. 1462 (6). Llandaff, bp. of. See Salley, M.
-, -, bpric. of, 438 (1 m. 24). Llanddewi Brefi (Llantheweebrevee), collegiate church, co. Cardigan, g. 132 (12). Llanddyfnan (Llandifbenam), co. Anglesea, rector of, 438 (4 m. 18). Llandeffrodok, co. Anglesea, 438 (4 m. 25). Llandeinol (Llantheynoll) alias Carrog, co. Cardigan, g. 132 (12). Llanderfel (Llanthervell), co. Merioneth, 438 (4 m. 27). Llandeylo, co. Carmarthen, g. 784 (24). Llandovery (Llandeverour), co. Carmarthen, g. 784 (24). Llandrillo yn Rhos alias Denerth, co. Denbigh, 438 (3 m. 18). Llanfawr (Llanvawre) in Penllyn deanery, co. Merioneth, 438 (3 m. 18). Llanfernach (Llanwernache), co. Pembroke, 438 (3 m. 23). Llanfihangell (Llanvehengell), co. Llandaff, rector presented, g. 485 (60). Llanfihangel Abercowyn, co. Carm., 438 (2 m. 25). Llanfynyd (Lanvenit), co. Carmarthen, g. 132 (116). Llangunnok (Langonnok), Heref. [in Llangarran], 438 (2 m. 16). Llanmerewig (Thalnmorek), co. Montgomery, 438 (2 m. 27). Llannor (Llanormon), co. Caern, 438 (1 m. 19). Llanstephan, co. Carmarthen, g. 54 (29). Llantillio, Marches of Wales, 438 (1 m. 25). Llantrisham castle, co. Glamorgan, g. 749 (2). Llan Trissaint (Llantrisshen), co. Glamorgan, g. 587 (9). Llantwit (Lantwyt), co. Glamorgan, 438 (2 m. 19). Llantwit by Neath (St. Iltuti de Neth), rector presented, g. 2222 (2). Llanwinio (Lanwynno), co. Carmarthen, 438 (3 m. 23). Llevenethe (Llybenyth), co. Monmouth, g. 924 (11). Llewellyn, Glin, g. 54 (43). Llowes, in Wales, 1803 (1 m. 3). Lloyd or Lloid, David, g. 749 (4). -, -, Geoffrey, chaplain, g. 2772 (7). -, -, Hoel, 2480 (62). -, -, Hugh, 20 (p. 19), 82 (p. 42). -, - (Floyd), Humphrey, 1496 iii. -, - (Floyd), Jenkin, 20 (p. 15). -, -, Jevan, 438 (4 m. 25). -, - (Floid), John, 20 (pp. 13, 18), 82 (pp. 40, 42), 1803 (1 m. 3):g. 132 (123). -, - (Lloilld, Floyde), John, gentleman of the Chapel, 210, 707, 938, 1143, 2426, 3335:g. 1123 (52), 1172 (17). -, - (Ll'd), Maurice, 438 (3 m. 5):g. 54 (29). -, - (Floyd), Ric., 20 (p. 15):g. 94 (98), 257 (83). -, -, Rob., g. 132 (93). -, - (Thloyd), Roger, g. 2684 (23). -, -, Wm., g. 519 (43). Lobbe, Wm., 438 (1 m. 12). Lobons, John, mason, 307 (p. 142). Locarno (Lucarne, Locarum), in Italy, 1127 (p. 539), 1277 (p. 587), 1566, 1647. Loches (Lochies) castle, in France, 264. Lockerley (Lokerley), Hants, 438 (1 m. 16). Lockswell (Lokkeswell), Wilts, 438 (4 m. 26). Loddon, Norf., 438 (3 m. 5), 1803 (2 m. 5). Lodebyre, Nthld., 438 (2 m. 17). -, -, bp. of [Octaviano Maria Sforza], 1277 (p. 587). Lofte, Henry, hermit, g. 885 (7). 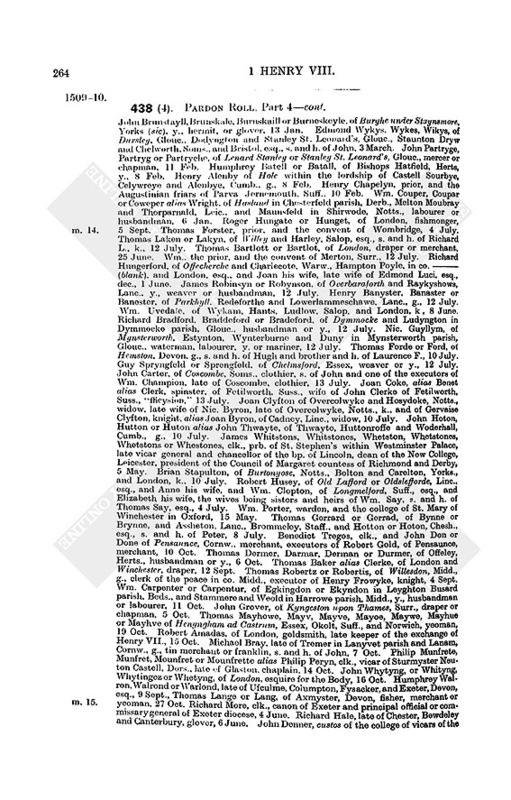 Logan (Lockent), John, a Scot, p. 1522. Logge, Warw., 438 (4 m. 24). Logiebride (Logybrid), in Scotland [in Auchtergaven], p. 15212, 1529. Logie Pert (Loguntrose), in Scotland, rectory of, p. 1522. Logroo (Longionio, Logrogno, Lucronii, Trollogrono), in Castile, 1432, 1459. -, -, letters dated at, 1359, 1369, 1458, 1509, 1511, 1515. Lok (Loke, Look), John, mercer, 438 (3 m. 31):3499 (26). Loksmyth, John, 20 (p. 19), 82 (p. 40). Lokton, Rob., s. and h. of Geoffrey, g. 3499 (22). Loly or Lole, Ric., 438 (2 m. 5). Lombardy and the Lombards (Lumbardys), 1007, 1020, 1489 (p. 679), 1695, 1866 (p. 851), 1892, 2006 (p. 908), 2746, 3527, 3544. Lombart, Pierre, French prisoner, p. 928. Lomelyn or Lomylyn, Bartholomew, merchant of Genoa, g. 2137 (20). -, -, Dominico, merchant of Genoa, 52:g. 1172 (1), 2055 (87), 2137 (20). Lond, Rob., g. 1494 (16). LONDON (minor references omitted), 205 (p. 106), 711, 874 (2), 1046, 1080, 1409 (2), 1661 (p. 752 bis), 1728, 1752, 1794, 1864, 1898, 1912, 1915, 2054, 2467, 2590:g. 11 (10), 833 (11), 924 (36), 969 (5 2), 1170 (2), 1462 (38), 1524 (34), 1732 (21), 1836 (6), 2222 (12, 16). -, -, letters dated at, 4, 5, 7, 98, 156, 230, 238, 264, 275, 332, 365, 385, 395, 413, 421, 430, 434, 450, 455, 463 ii., 474, 4768, 493, 508, 514, 531, 569, 601, 615, 652, 674, 734, 759 ii., 793, 812 ii., 825, 854, 871, 882, 896, 911, 917, 933, 937, 941, 9489, 952, 964, 973, 998, 1013, 1016, 1050, 10523, 1067, 1128, 1158, 11667, 1183, 1209, 1216, 1291, 1307, 1310, 1321, 1323, 1371, 1377, 1391, 1403, 1417, 1439, 1475, 1477, 1484, 1502, 151213, 1522, 1546, 1550, 1552, 1578, 15867, 1591, 1628 (2), 1702, 1762, 1766, 1769, 1949, 1956, 196970, 2013, 2060, 2067, 2111, 2160, 2223, 2229, 2265, 2278, 2412, 2457, 2490, 2493, 2573, 2626, 2632, 2654, 2722, 2724, 2747, 2773, 2844, 28478, 2852, 2902, 2942, 3003, 3018, 3024, 3029, 3034, 30401, 3045, 3068, 3073, 3097, 3102, 3108, 3141, 3151, 3268, 3270 ii., 3282, 3295, 32978, 3351, 3366, 3374, 3386, 3388, 3500:pp. 151011. 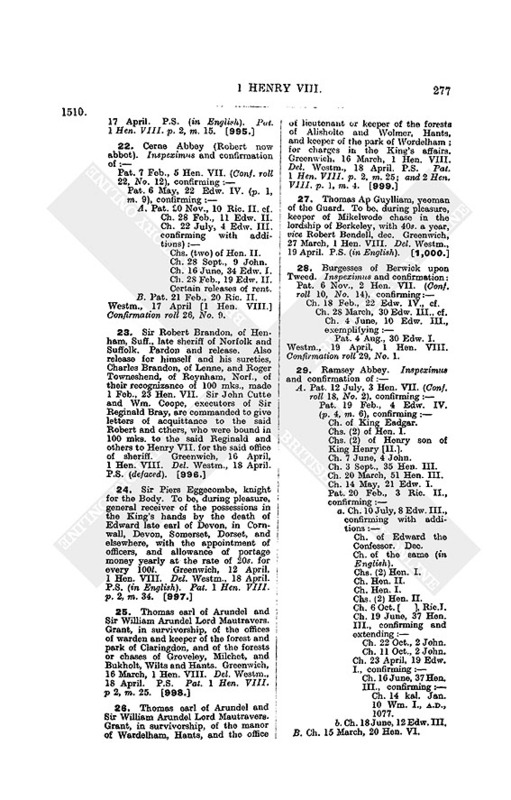 -, -, deeds and grants dated at, 52, 468, 3142, 3180:g. 190 (31), 632 (53). -, -, Act concerning juries, 1471. -, -, aldermen, 20 (p. 20), 438 (1 mm. 10, 18, 19, 20), 438 (2 m. 8 bis, 13 bis), 2929. 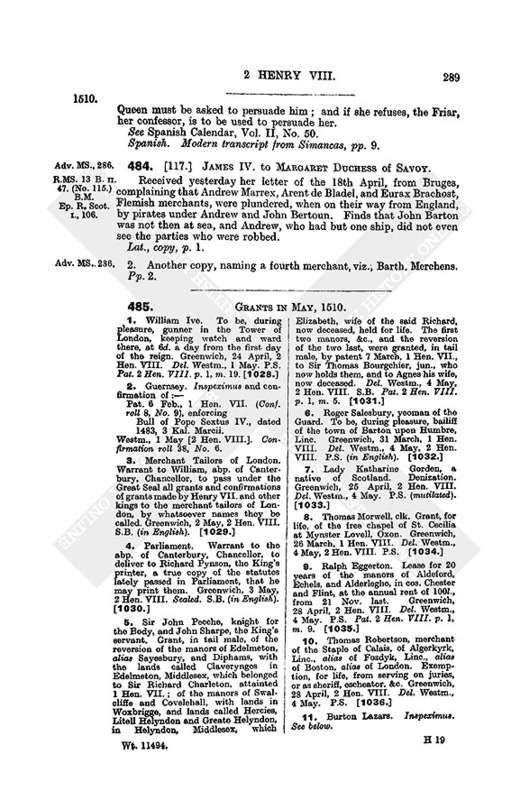 -, -, Barber Surgeons Company, g. 1123 (32). -, -, complaint against the curates, 3602. -, -, Fishmongers Company, g. 1804 (19). -, -, -, grant of arms, 1442. -, -, Goldsmiths Company, confirmation for, g. 414 (49). -, -, Grocers' Company, g. 1316 (4). 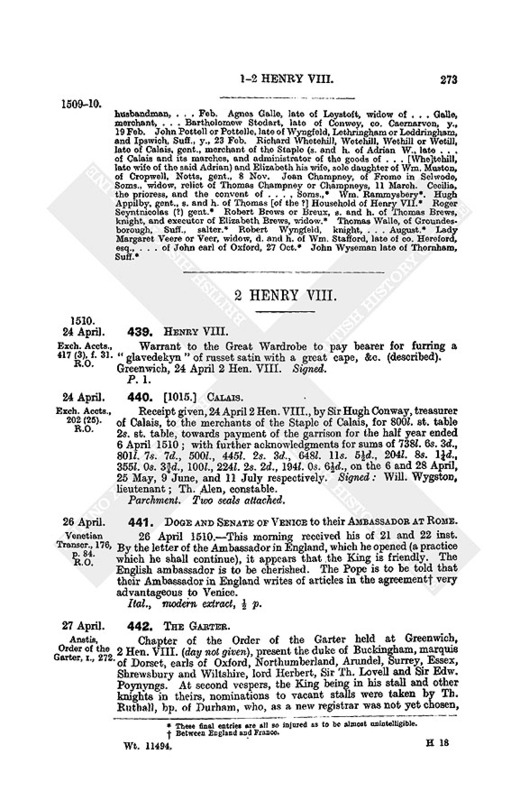 -, -, Haberdashers' Company, confirmation of charter, g. 632 (32). -, -, Innholders' Company, g. 3582 (25). -, -, Italian merchants, 917. -, -, juries (Act), 2590 (15). -, -, keepers of the changes, confirmation of charters, g. 1266 (2). -, -, mayor of, 2480 (40):g. 2222 (16 London). -, -, - See Jennings, Sir S. (15089); Haddon, R. (151213). ; Browne, W. (151314). -, -, mayor and commonalty, 1493 iv. 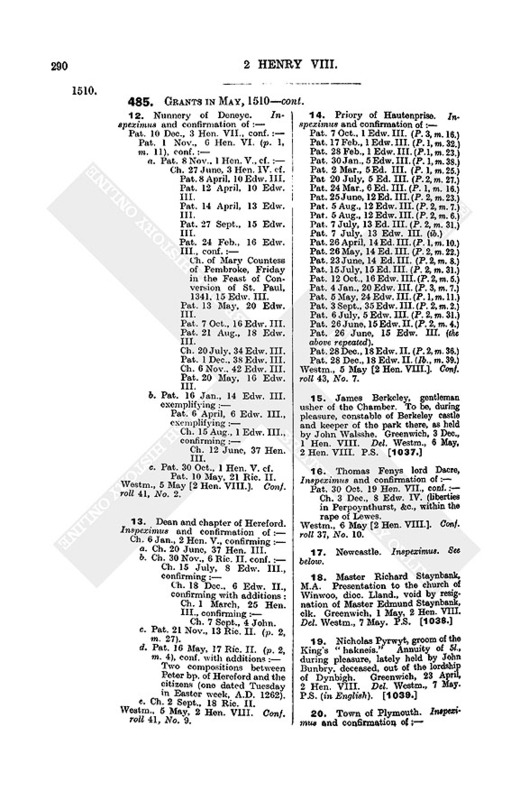 -, -, Mercers Company (Mercery), 1761:p. 1498:g. 519 (13, See Notes and Errata), 1732 (4), 1804 (40), 2617 (21). -, -, Merchant Adventurers. See under Merchant. -, -, Merchant Tailors, 438 (1 mm. 3, 8, 19 bis, 22, 24), 438 (2 m. 12), 438 (3 mm. 6, 16, 21, 33), 438 (4 mm. 19 bis, 21), 763, 1803 (2 mm. 1, 2, 6):pp. 15012:g. 1415 (19), 1524 (42), 1804 (25). 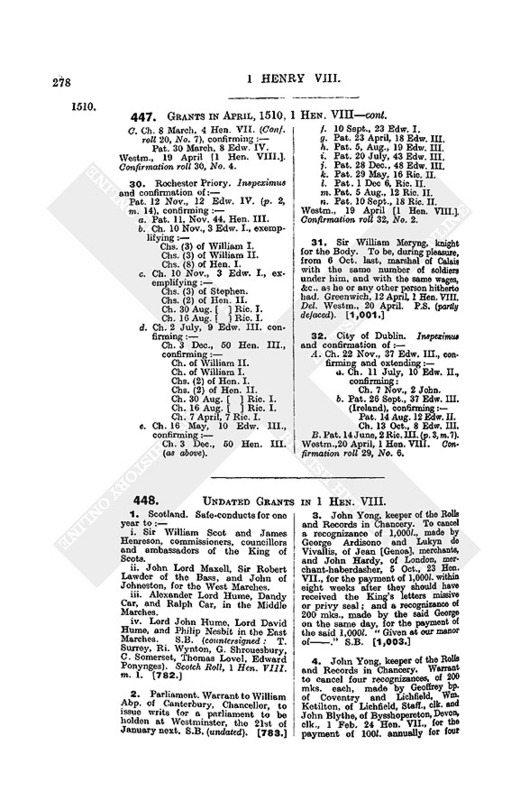 -, -, -, confirmation of charters for, g. 485 (3), 682 (18). -, -, Pewterers Company, confirmation of charters, g. 1602 (28). -, -, Plasterers Company, confirmation of charter, g. 1003 (4). -, -, port of, 438 (2 m. 20), 3085, 3313 (6). -, -, -, customs and customers, 312, 438 (1 m. 5 bis, 10), 438 (2 m. 20):g. 94 (27, 32, 34, 38, 73, 95), 132 (14, 44, 54), 158 (445), 190 (45), 218 (14), 257 (66), 289 (34), 357 (7, 8), 381 (23), 519 (23, 58), 546 (24, 67), 604 (2), 632 (25, 68), 651 (5, 30), 682 (5), 885 (16), 969 (22, 71), 1044 (14), 1123 (9), 1172 (2), 1221 (38), 1266 (25, 40), 1316 (33), 1462 (7, 20), 2684 (91), 2964 (48), 3049 (1), 3107 (4). -, -, -, gauger of, g. 449 (2). -, -, -, packership, 2590 (8). -, -, -, surveyor of customs. See Heron, J. -, -, -, surveyorship of the port, 2590 (18). -, -, -, troner and peiser, g. 54 (19). -, -, -, wherries in, g. 158 (45). -, -, recorder of, 438 (1 m. 8). See Sheffield, Sir R.
-, -, serjeant at the mace, 438 (3 m. 7). -, -, sheriffs, 20 (p. 20), 438 (1 m. 3), 3353:g. 158 (74). -, -, Stockfishmongers Company, 438 (4 m. 28). -, -, sword bearer of, 20 (p. 20). -, -, ulnage of cloth in, g. 1221 (34). -, -, vice-chamberlain of, 20 (p. 20). -, Algate or Aldgate, 438 (2 m. 28), 1416. -, Allhallows, g. 833 (70). -, Allhallows, Barking, vicar of, 1811. -, All Hallows Bredstrete, g. 2617 (7). -, All Hallows, Hony Lane, g. 1415 (7), 2617 (7). -, Allhallows the Little, g. 132 (13). -, All Hallows, Lombard Street, g. 1804 (37). -, All Hallows, London Wall, g. 1415 (7), 2617 (7). -, Allhallows the More, g. 709 (52). -, -, rector presented, g. 632 (75). -, All Hallows Stanynges or Staynyng, g. 519 (7), 857 (14). -, Angel without Temple Bar, 1397. -, Arches, Court of, 1803 (2 m. 2). -, Austin Friars, 933, 949, 2929:g. 2684 (69). -, -, prior. See Toneys, J. -, -, Guild of St. Mary, g. 3107 (30). -, Barnard's Inn, 438 (3 mm. 6, 23). -, Baynards (Baynaudes, Castrum Bernardi) Castle, 1420, 1801 (2), 1858, 1982, 2010, 2765, 3018:p. 1516:g. 94 (35 p. 50), 1836 (32). -, -, letters dated at, 1150, 1750 (3, 4), 2308:pp. 1510, 1520:g. 2055 (80). -, Berebynder Lane, g. 519 (7). -, Bethlehem hospital (St. Mary of Bethlehem), warden, g. 1123 (61). -, Bishop of London's palace beside St. Paul's, 20 (pp. 12, 21), 3003. -, Black Friars, or Friars Preachers, 353, 1420, 2590, 3017 (2), 3185:g. 2617 (18). -, -, annuity to, g. 132 (24). -, -, prior of, 2765, 3017 (2). -, Black Wall (Blake Wale), 2546, 2865, 3137 (15). -, Blomesbury, 438 (3 m. 26). -, Borthalane or Bordhawlane, g. 3499 (18). -, Botolph's (Bottalles, Botoll), quay or wharf, 2167 (1, 2), 3420. -, Bow Lane, g. 709 (52). -, Bredstrete, g. 1266 (7). -, Bridewell, Wolsey's house at, 1969. -, Bridge House, 20 (p. 20). -, -, master of the, 438 (1 m. 25). -, Buklersbury, g. 604 (23), 1662 (33). -, Bush Lane, g. 833 (14), 1415 (3). -, Candelwyke, Candewyke, Canwyk Street, 146:g. 289 (12), 2055 (74). -, Carlisle lands, g. 1316 (11). -, Chancery (Chaunsler) Lanc, g. 2964 (64). -, Charing Cross, 1 (p. 2), 20 (p. 21), 2539:g. 1316 (11). -, Charterhouse, 438 (2 m. 15), 3374:g. 546 (30), 3107 (19). -, -, William prior of, 438 (2 m. 15), 492. -, -, -, letter to, 492. -, Chepe or le Chepe, g. 731 (8), 1494 (40), 2617 (7). -, -, Great Conduit in, g. 1415 (7), 2617 (7). -, Christchurch priory. See below, Holy Trinity. -, Church Alley, g. 2684 (77). -, Clements Inn, 438 (1 mm. 10 bis, 15), 438 (3 m. 3, 22), 1118. -, Clerkenwell, 438 (1 m. 4), 438 (2 m. 30). -, Clifford's Inn, 438 (3 m. 7, 8), 438 (4 m. 18). -, Coldharbour (Coldeharbrough), g. 132 (13, 29). -, Conys Wharf, p. 1515. -, Cornhill, g. 357 (32), 604 (15). -, Counter prison, g. 857 (22), 1266 (7), 1316 (38). -, -, in Breadstreet, 20 (p. 12). -, -, in the Poultry, 20 (p. 12). -, Cow Cross Street, g. 1836 (10). -, Croked Lane, g. 381 (2). -, Crutched Friars, 3568 (2):p. 1532. -, Custom House, 438 (2 m. 17), 559:g. 94 (39). -, Cussyn Lane, g. 709 (52). -, Distaf Lane, g. 519 (7). -, Dovegate, g. 709 (52). -, Dowgate Ward, g. 833 (14), 1415 (3). -, Durham Place, 438 (1 m. 25). -, Durham Rents, 438 (1 m. 25). -, Dyers' Company, g. 1948 (25). -, Ely Place, g. 731 (2). -, Fanchurche Street, g. 519 (7). -, Farringdon Ward, g. 2684 (77). -, Fenkeslane. See below, Fynkes. -, Fetter (Fater) Lane, g. 731 (2). -, Fleet prison, 725, 2441 2804, 3389, 3447:g. 604 (40). -, -, keeper of, 438 (1 m. 26). -, -, warden of, 438 (2 m. 25). See Villers, W.
-, Fleet Street, 20 (p. 21):p. 1512:g. 381 (29), 651 (23). -, -, sign of the Walsshman, g. 381 (29). -, Fynkes, Fynkys, Fenkes, Lane, g. 357 (32), 604 (15), 1948 (100). -, Goldsmiths' Hall, 2781 ii. -, Grays Inn (Greysin), 438 (1 mm. 1, 4), 438 (2 m. 8, 23), 438 (3 m. 12), 438 (4 mm. 2, 19), 1803 (2 m. 3), 2733. -, Grey Friars ("Place of St. Francis"), warden. See Cutler, J. -, Grubstrete, g. 3107 (52). -, Holborn, 438 (3 mm. 6, 9, 17, 21, 23), 438 (4 m. 8):g. 731 (2). -, -, White Hart inn, 2024. -, -, prebendary of [in St. Paul's], 438 (3 m. 13). -, Holy Trinity, alias Christchurch, priory, 438 (1 m. 19), 1406 (4). -, -, confirmation for, g. 1804 (24). 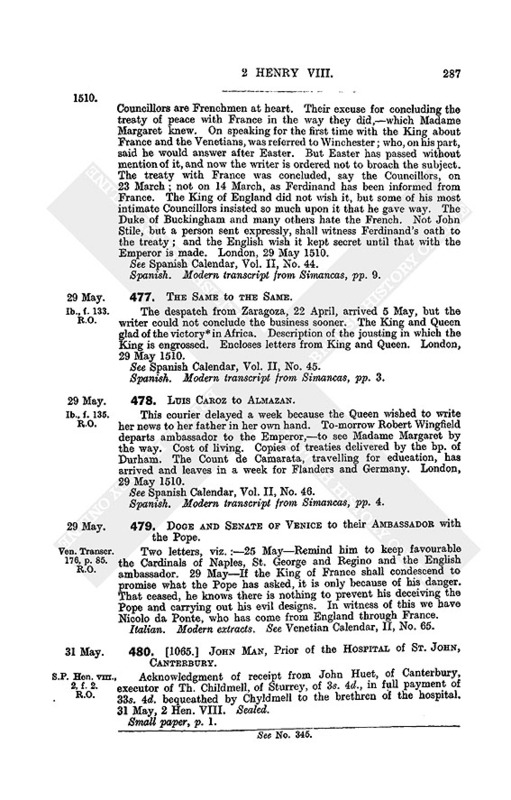 -, -, election of prior, g. 1365 (10), 1415 (5), 1462 (22, 38), 1662 (21), 1948 (84). -, -, prior. See Percy, T.; Bradwell, J. -, Holywell (Halywell) nunnery, g. 804 (31). -, Hospital of St. Thomas. See below, St. Thomas. -, Houndsditch (Hondesdyche, Hunsdyche, Hundiche), 2812, 3251:pp. 1512, 1514. -, -, Belle Howse in, 3521. -, Inner Temple, 438 (1 m. 7), 438 (2 m. 8), 438 (3 m. 4). -, King's Bench prison, 20 (p. 12):g. 190 (35). -, Langborn ward, g. 519 (7). -, Ledon Hall, 20 (p. 12):g. 381 (47). -, Le Herber inn, g. 1415 (3). -, Lime Street, p. 1514. -, Lincolns Inn, 438 (3 m. 1), 1803 (1 m. 1, 2 m. 6), 3068:g. 2964 (64). -, Lombard Street, 2945 (p. 1274):g. 604 (34). -, London Bridge, 20 (p. 20), 559 (p. 327):p. 1514. -, -, masters of, g. 1415 (7), 2617 (7). -, Ludgate prison, 20 (p. 12). -, -, keeper of, 438 (3 m. 13). -, Lyon's Inn, 438 (2 m. 4). -, Marshalsea prison, 763:g. 546 (23), 3049 (34). -, Marte Lane, g. 857 (14). -, Mayden Lane, g. 519 (7). -, Middle Temple, 392, 438 (2 mm. 12, 26), 438 (4 m. 1). -, Mile End (Mylles hend, Millhend), 2834, 3222, 3251:pp. 1515, 1519. -, Newgate gaol, 20 (p. 12):g. 218 (1), 709 (62), 731 (27), 924 (14), 969 (17), 1732 (2, 16), 2484 (15). -, New Hospital of St. Mary. See below, St. Mary Spittle. -, New Inn, 438 (3 m. 7). -, -, principal of, 438 (3 m. 16). -, New Temple, bars of the, 438 (2 m. 4). -, Old Bailey, g. 381 (29), 651 (23). -, Old Temple, bars of the, 438 (3 m. 24). -, Paternoster Row, g. 1415 (7), 2617 (7). -, -, Lovelles Inn, g. 1662 (58). -, Poultry, 438 (4 m. 1). -, Prince's Wardrobe, g. 414 (69). -, Ratcliff. See under R.
-, Redcross Street, 723:g. 257 (56). -, Roiall, the, g. 381 (14). -, Rolls House ("house of the Converts"), g. 94 (44). -, -, account of keeper of the House of Converts, 2587. -, -, rector of, 707 (p. 383). -, -, rector presented, g. 2617 (45). -, St. Andrew's Holborn 438 (1 m. 21), 438 (3 mm. 24, 28), 438 (4 m. 7):g. 2684 (77). -, St. Andrew Undershaft (Viderschafre), rector of, p. 1521. -, St. Anne and St. Agnes, rector of, pp. 1524, 1526. -, St. Augustine's, g. 447 (8). -, St. Bartholomew's hospital in West Smithfield, 438 (3 m. 31). -, St. Bartholomew's priory, beside Smithfield, 438 (4 m. 21), 1803 (1 m. 4). -, -, prior. See Bolton, W.
-, St. Benet's at Polles Wharf, p. 1520. -, St. Botolph's without Aldersgate, g. 731 (20). -, St. Botolph's near Billingsgate, g. 1462 (19). -, St. Bride's (Brydis), parsonage in Fleet Street, g. 218 (13):g. 357 (43). -, St. Clement's Danes or St. C. without Temple Bar, 438 (1 m. 1, 2), 438 (2 mm. 4, 5, 12, 14, 17, 29), 438 (3 mm. 3, 7, 15, 22, 26, 31), 438 (4 m. 16), 3142:g. 1003 (22), 1316 (11), 1662 (46). -, St. Dunstan in the West, g. 1462 (15). -, St. Ethelburga, g. 2772 (24). -, St. Faith's, g. 1662 (58). -, St. Giles without Cripplegate, 438 (2 m. 22):g. 257 (56), 731 (33), 1083 (14), 1415 (7), 2617 (7), 3107 (52). -, St. Giles in the Fields, 438 (1 m. 25):p. 1513:g. 289 (13). -, St. Giles hospital without Old Temple Bar, 438 (2 m. 11). -, St. Helen's, beside Bishopsgate, nunnery, g. 604 (15), 1948 (100). -, St. James in Garlikhithe, g. 1415 (7), 2617 (7). -, St. John's, jurisdiction of, 438 (3 m. 20). -, St. John's Street, 438 (1 m. 1), 438 (2 m. 19), 438 (3 mm. 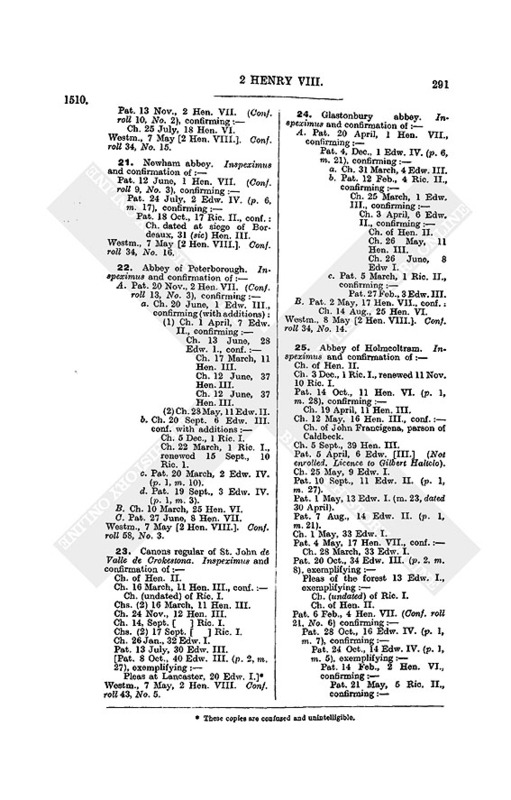 10, 18):g. 1836 (10). -, St. John Baptist upon Walbroke, g. 414 (60):g. 563 (1). -, St. Katharine's hospital beside the Tower, 438 (1 m. 19), 579, 1429:g. 94 (4). -, -, confirmation for, g. 447 (10). -, -, jurisdiction of, 438 (3 m. 20). -, -, master. See Preston, J. -, St. Laurence Jewry, g. 731 (33). -, St. Laurence Lane, 1664, 1761:g. 731 (8), 2617 (7). -, St. Laurence Pountney or Poulteney college, 631. -, -, master. See Roston, Ric. -, St. Leonard's Shoreditch, 438 (2 m. 29). -, St. Magnus, rector of, 438 (4 m. 27). -, St. Margaret's, g. 381 (2). -, St. Margaret's Lothbury, 78. -, St. Margaret Moyses in Friday Street, rector presented, g. 651 (29). -, St. Margaret Pattens, g. 190 (17). -, St. Martin's in the Field, 438 (1 m. 25). -, St. Martin's le Grand, g. 485 (55 p. 298), 731 (20). -, -, commissary of, 438 (3 m. 14). -, St. Mary Aldermary (Aldermarichurch), g. 1415 (7), 2535 (16). -, St. Mary Axe, indulgence for church repairs, g. 2862 (4). -, St. Mary of Bethlehem, hospital, g. 2055 (45). -, St. Mary le Bow, g. 1415 (7), 2617 (7). -, St. Mary Bothowe, g. 833 (41), 1415 (3). -, -, le Herber inn, g. 833 (14). -, -, rector of, pp. 1527, 1531. -, St. Mary Colchurche, g. 604 (23), 1662 (33), 2772 (24), 3499 (18). -, St. Mary Graces. See below, Tower Hill. -, St. Mary Magdalen, Milkstreet, g. 357 (33), 749 (28). -, St. Mary Matfelon, 438 (2 m. 28):g. 731 (20). -, St. Mary Spittle, or the New Hospital of St. Mary without Bishopgate, 20 (p. 12), 438 (2 m. 15):g. 3408 (39). -, -, prior of. See Creshall, R.
-, St. Mary de Rouncidevall, chapel [at Charing Cross], confirmation for, g. 381 (96). -, -, master. See Longe, L.
-, St. Mary le Strand, 438 (1 m. 17), 438 (2 m. 20), 438 (4 mm. 24, 26):g. 1316 (11). -, St. Mary's Wolchurche, g. 519 (7), 749 (16). -, St. Michael ad Bladum, rector of, p. 1524. -, St. Michael Basingshawe, g. 94 (20), 604 (9), 731 (20), 2861 (36). -, St. Michael Cornhill, g. 604 (15), 1948 (100). -, St. Michael Crooked Lane, dean of the college. See Brent, T.
-, St. Michael Paternoster, g. 709 (52). -, St. Michael Queenhithe, g. 632 (54), 1415 (7), 2617 (7). -, -, rector of, 438 (3 m. 13), 1803 (2 m. 3):p. 1521. -, St. Mildred in the Poultry, g. 257 (19), 1494 (40). -, St. Nicholas Acorn, g. 731 (20). -, St. Nicholas Fleshambles, or at the Shambles, 1416:g. 2684 (77). -, -, rector of, 458 (2 m, 25). -, St. Pancras, g. 1415 (7). -, St. Paul's Cathedral (Powlys), 19, 20 (pp. 11, 19, 201,), 342, 438 (2 mm. 12, 13), 438 (4 m. 22), 559 (p. 327), 936, 949, 1750 (5), 2122, 2355, 2469, 292931, 3003, 3523, 3549:g. 682 (25), 969 (75), 1804 (40), 1948 (95), 2772 (28), 3499 (10). -, -, altar of St. Katharine, p. 1528. -, -, College of Minor Canons, confirmation for, g. 731 (9). -, -, confirmation for, g. 447 (7). -, -, dean. See Colet, J. -, -, dean and chapter, 1 (p. 2), 438 (2 m. 18). -, -, precentor of. See Ferdinandus, R. G.
-, -, treasurer of, 438 (2 m. 26). -, St. Paul's bakehouse (Poulis Bakehoce), 612. -, St. Paul's Churchyard, g. 519 (13). -, St. Paul's School, founded by Dean Colet, 931, 1122, 1167, 2088:App. 5:g. 519 (13, see Notes and Errata), 1804 (40), 2617 (21). -, St. Peter's, g. 749 (28). -, St. Peter's in Chepe or West Chepe, g. 357 (33), 1415 (7), 2617 (7). -, St. Sepulchre's without Newgate, 438 (4 m. 25), 763:g. 190 (23), 731 (20), 1003 (22), 1524 (37), 2684 (77). -, St. Stephen's, Colman Street, g.833 (16), 1732(4). -, St. Stephen's Walbrook, rector, 2395. -, St. Swithin's, 559 (p. 327). -, St. Swithun in Candylwykstret, p. 1548:g. 1415 (7), 2617 (7). -, St. Swithin's beside London Stone, 146. -, St. Thomas of Acres, 1761:p. 1526. -, -, master. See Young, J. -, Savoy (Savye), 2480 ( 2), 2574, 3483. -, -, steward of, 438 (2 m. 12). -, Savoy hospital, g. 1316 (11), 2617 (18). -, -, building of, 1 (p. 2). -, Shordiche, 438 (2 m. 7), 438 (3 mm. 1, 32). -, Snowrehill, g. 190 (23). -, Staple Inn, in Holborn, 438 (1 m. 15). 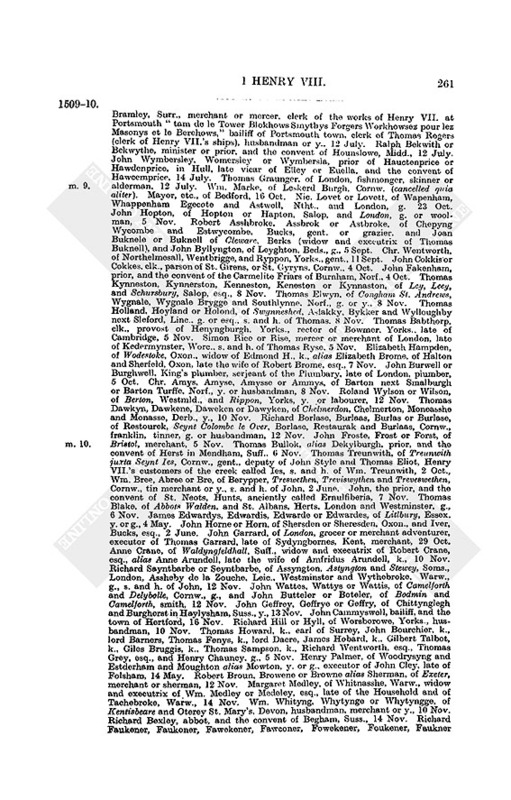 -, Steelyard (Styllard) or Guildhalla Teutonicorum, 903, 1395, 2668, 2765, 2831, 2832 (v., vi.):pp. 150811, 151315:App. 14. -, -, confirmation of charters for, g. 381 (68). -, -, inward pricker, g. 289 (36). -, Strand (Strond) 438 (2 m. 8), 1803 (2 m. 6):p. 1518. -, Strand (Stronde) Cross, g. 1316 (11). -, Strand (Strond) Inn, without Temple Bar, 438 (4 mm. 7, 16 bis). -, Temple, 1803 (2 m. 6). -, Temple Bar, 438 (3 m. 7):g. 632 (83 ii.). See also New Temple and Old Temple. -, Tower, 81, 110, 118, 185, 438 (4 m. 24), 55960, 876, 877n, 978, 1394, 1450 (p. 661), 1463 v., vi., viii., 1513, 1572, 1960, 2072, 2220, 2226, 2416, 2482, 2546, 2606, 2668, 2683, 2719, 2812, 2832 iii., v., 3017 (2), 3137 (16), 3162, 3251, 3421, 3432, 3484, 3506, 3539, 3555:pp. 1511, 151315, 1519:App. 14, 17:g. 54 (82), 1123 (57), 1415 (25), 1732 (41). -, -, grants dated at, g. 11 (10), 54 (25, 156, 38, 79), 94 (1001), 257 (28), 289 (29, 3942, 478), 381 (89, 90), 414 (44), 546 (7, 1921), 682 (223, 33), 709 (17). -, -, letter dated at, 273, 516. -, -, chaplain of, g. 190 (21), 257 (46). See Surland, R. ( 1509); Norton, R.
-, -, constable, g. 54 (16), 1732 (41). See Oxford, Earl of; Lovell, Sir T.
-, -, deputy lieutenant of, 438 (3 m. 4). See Cholmondeley, Sir. R.
-, -, gunners, 438 (2 m. 7):g. 132 (74, 104), 190 (2), 218 (51), 289 (39), 357 (25), 485 (1), 519 (9), 632 (67), 1003 (2), 1123 (24), 1172 (14), 1266 (29), 2535 (7), 2617 (32), 2964 (29), 3226 (23), 3499 (1), 3582 (24). -, -, -, their pay, 311. -, -, keeper of the arrows, g. 94 (21). See Hende, W.
-, -, keeper of the bows, g. 604 (25), 1123 (57). See Southworth, H.
-, -, keeper of the garden, g. 218 (46), 924 (5). -, -, keeper of the lions, &c., g. 54 (14), 1804 (13). See Oxford, earl of: Worseley, J. -, -, Martyn tower near the Lion tower, g. 257 (72). -, -, master mason, g. 546 (72). -, -, master smith, g. 257 (96), 2684 (71). See Woodland, C.; Johnson, C.
-, -, Mint and Change in. See Mint. 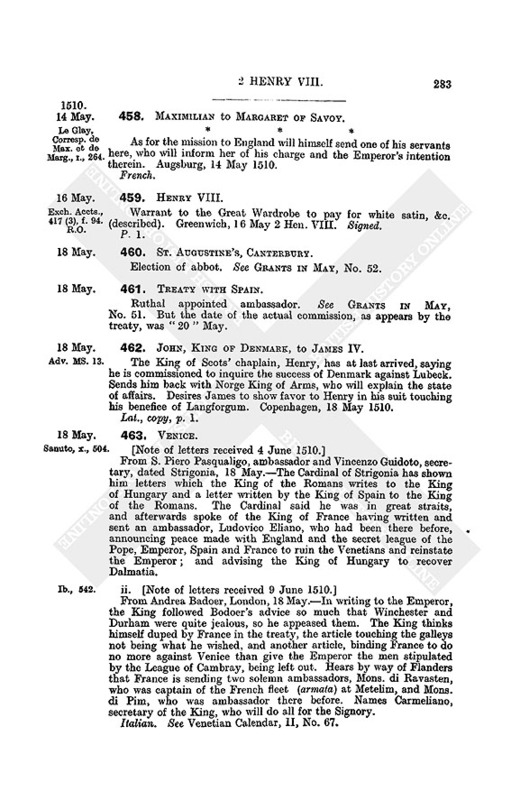 -, -, ordinances for the garrison, 118. -, -, porter, 438 (2 m. 13):g. 485 (57). -, -, works at, 1954, 3251, 3307, 3363, 3410:g. 158 (11), 682 (37). -, -, yeomen of the Guard (yeomen of the Chamber attending in the Tower), App. 13. See also Henry VIII. -, -, yeomen's livery, 265. -, Tower Hill (or St. Mary Graces) abbey, 438 (3 m. 16):p. 1530:g. 857 (14), 3107 (31). -, -, abbot of, g. 969 (45). See Langton, J.; Prehest, R.
-, -, confirmation for, g. 682 (32). -, Tower Street, the King's Armoury, p. 1517. -, Tower Wharf, 1704:p. 1514. -, Walbroke, g. 519 (7). -, Wardrobe or Great Wardrobe, 20 (p. 17). See also under Henry VIII. -, Warwick's Inn, g. 2137 (4), 2772 (9). -, Watelyng Street, g. 833 (70). -, West Smithfield, g. 2684 (77). -, West Smithfield priory. See above, St. Bartholomew's. -, Whitechapel, p. 1512:g. 969 (45). -, Whitecross Street, g. 257 (56), 1415 (7), 2617 (7). -, Whittington College, 438 (1 m. 23). -, Wood Street, g. 749 (28). -, Worcester place, g. 1316 (11). London, Treaty of (23 March, 1510), 2957. London, bishop of, See FitzJames, Ric. -, -, -, confirmation for, g. 414 (63). -, -, -, consistory court, 631. -, -, -, official of, g. 546 (64). London, Augustine, abbot of Wardon, 438 (2 m. 31). -, -, John, 438 (3 mm. 4, 11). -, -, Mr. John, rector of Lifton, g. 158 (51). Long or Longe, Alex., 438 (3 m. 24). -, -, Henry or Sir Henry, 438 (2 m. 13), 1453, 3483:App. 9, 26:pp. 1546, 1548:g. 651 (7), 969 (23), 1948 (75), 2055 (99). 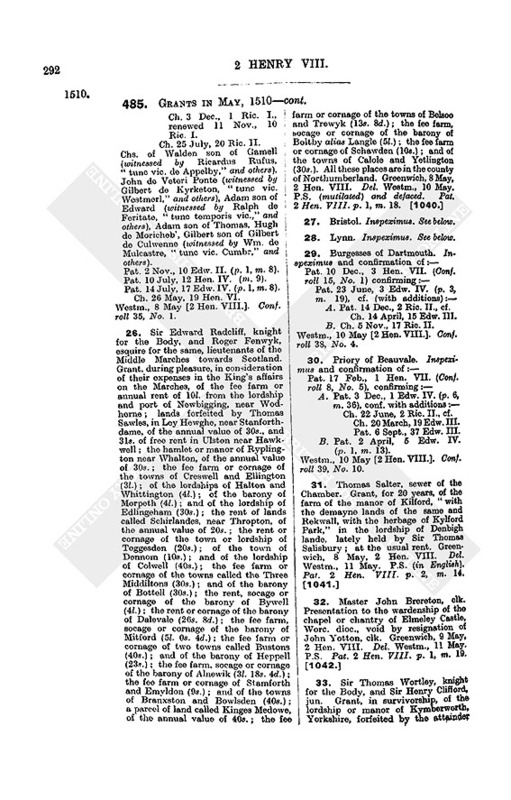 -, - (Lang), John, 1803 (2 m. 4):p. 1548. -, -, Laurence, master of St. Mary de Rouncival, g. 381 (96). -, - (Laung), Matthew, archd. of Surrey, 1803 (2 m. 5). -, -, Ric., 438 (4 m. 25), 2337, 3338:g. 1221 (45), 1804 (39). -, -, Th., 438 (2 m. 13). -, -, Wm., 438 (4 m. 25). Longbridge (Langbrigge), hospital or priory [in Berkeley, Glouc. ], g. 751 (1). Longden Dale (Londondale), Chesh., g. 2617 (20). Longdon, Salop, g. 2684 (1). Longdon (Longedon), Staff., g. 709 (22). Longdon, Worc., 438 (2 m. 24). Longdon, Rob., g. 3499 (12). Longevile. See Longueville; also Longvile. Longford (Langforthe), Derb., 438 (3 m. 1). Longford (Lanford), near Gloucester, g. 2055 (14). Longford (Langford) Cervington, Wilts, 438 (1 m. 13). Longforgan (Langforgum), in Scotland, 462. Longfylde, Duke of. See Longueville. Long Leadenham (Longledonham), Linc., rector of, p. 1526. -, -, -, presented, g. 1524 (19). Longland, John, D.D., rector of Lifton, g. 2055 (27). Longley, prebend in Lanchester, Dham., p. 1525. Longueville, in Normandy, abbey of St. Faith, g. 1221 (28). Longueville (Longavylla), Francis de Bourbon, duke of ( 12 Feb. 1513), comte de Dunois, 406, 1055, 1064, 1081, 1087, 1090, 1127, 1509, 1511 (p. 698), 1647 (p. 743), 2237. -, -, -, his son's death, 1647 (p. 743). -, - (Longheville), Louis d'Orleans [de Bourbon], duke of, marquis of Roteln (Ruttelyn, Rotolin), comte de Dunois, 2168, 21702, 2173 (3), 2182, 2198, 22034, 22267, 2230, 2237, 2249, 2254 ii., 2261, 2299, 2391 (p. 1059), 2392 iii., 2556, 2597, 2620, 2633, 2729, 2929, 29567, 2994, 2996, 3003, 3009, 3018, 3024, 3087, 30983100, 3124, 312931, 31467, 3151, 31556, 3160, 3171, 3186, 3189, 3198, 3201, 3210, 3225, 3269, 3298, 3323, 3331, 3348, 3364, 3370, 3375, 3387, 3411, 3424, 3430, 3449, 3517, 3519:g. 3226 (24). -, -, -, letters from, 2729, 3155, 3230, 3239. -, -, -, letter to, 3188. -, -, -, commissions to, 30983100, 3134. -, -, -, his chaplain, 2556. Longvyle (Longuevyle, Longefyld), Sir John, 20 (p. 16), 438 (4 m. 5):g. 54 (82), 414 (46). Lonhaun, John, clk., a Scot, p. 1524. Lonnysburgh, William de, g. 158 (32). Lonsdale (Landesdale), Lanc., 438 (3 m. 4). Lonsdale (Lomesdale), Westmld., g. 1732 (1). Lonsdale (Lounesdale), Yorks and Lanc., 438 (1 m. 15). Looe (Loo, Lowe), Cornw., 438 (4 m. 13), 1801, 1982 (4). -, -, rector presented, g. 731 (35). Loore, James, g. 924 (23). Lopen, Soms., g. 2684 (96). 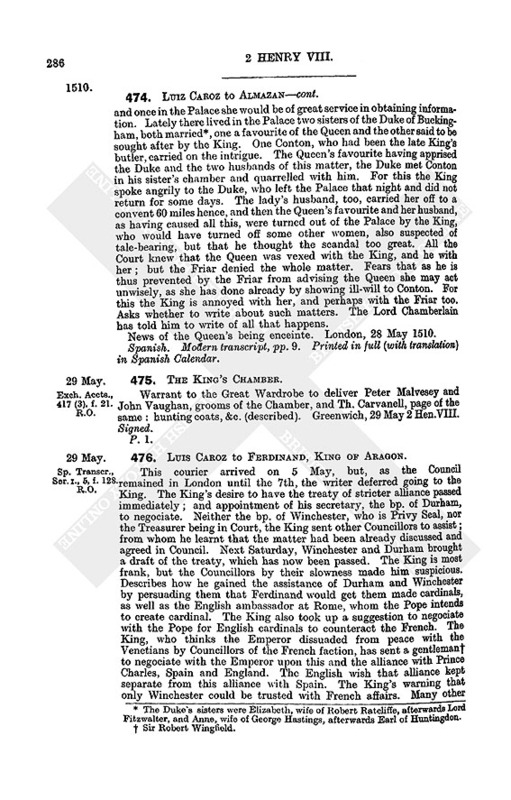 Lopez, Leonard, LL.D., Spanish envoy to England and Scotland, 1058, 1067, 1106, 11089, 1158, 126970. -, -, -, letter from, 1158. -, -, -, James IV's instructions to, 1106. Lord, George, p. 1519:g. 158 (11). -, -, -, bill of, 1954. -, -, James, 438 (2 m. 4). 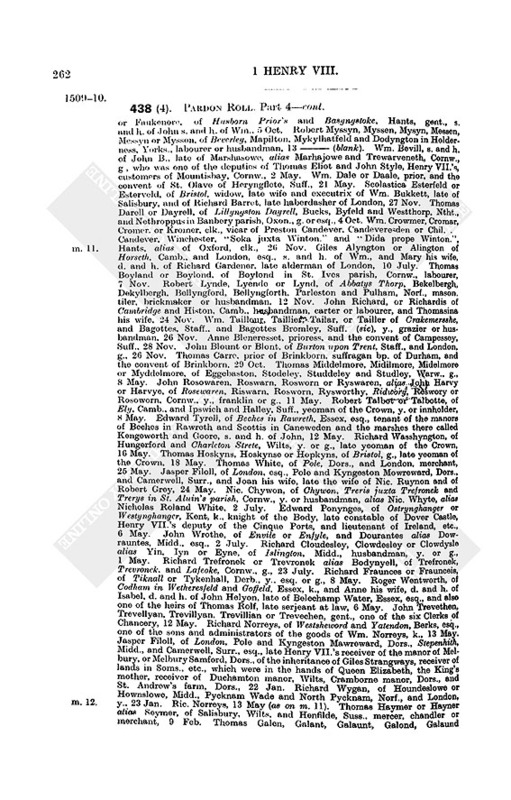 -, - (Laward), Robert, clerk to Sir John Daunce, 2050, 2961:g. 2772 (34). Loredano (Lauredano), Leonardo, Doge of Venice, 320, 372, 382, 430, 1276, 1358, 1373, 1426, 1594, 2010, 2234, 2566, 2596, 2755:g. 969 (40). -, -, -, letters from, 382, 1358, 1373, 1426, 2566, 2784, 3207. -, -, -, letter to, 3553. -, -, -, signature of, 3542. Loreden, Marcus, 20 (p. 19). Loret, M. de. See Soliers. Loretto, in Italy, 917, 958. Lorraine, Anthony duke of, 545, 965 ii., 1837, 2391 (p. 1059), 2577, 3240, 3348:App. 10. Lorraine, Alice daughter of Godfrey duke of, wife of Henry I., charter of, g. 519 (45). Losa, Domingo de, a Spanish ship owner, 1866. Loseby (Lowesby), Leic., 438 (3 m. 6). Losell, Edmond, 707 (p. 383). Lossenham (Losenham), Kent [in Newenham], 438 (3 m. 15). Lostwithiel (Lostithyell, Lostwytheel, Lastytheall), Cornw., 438 (2 m. 27), 438 (3 m. 22):g. 132 (19), 158 (16), 546 (25), 632 (69). -, -, confirmation of charters, g. 546 (11). -, -, stannary accounts, 2044. Lotham (Loham), Ntht., g. 969 (67). Lothersdale (Lodirsdane), Yorks, [near Dale End], g. 2772 (11). Lothingland (Luddynglond) humdred, Suff., g. 94 (35, 56), 682 (33). Loughborough, Leic., 438 (3 m. 4), 438 (4 m. 1):g. 54 (20), 289 (13), 357 (17), 833 (30). -, -, rector of, 438 (1 m. 18). Loughborough (Lughborow), Notts, rector of, 1803 (2 m. 3). Loughmoe (Lyethmacacmog, Liamocaernoc), vicarage, co. Tipperary, pp. 1523, 1530. Loughor or Lwchwr (Lloughourne), co. Glamorgan, g. 3049 (20). Loughrig, Westmld., g. 1732 (1). Loughton (Lufton), Essex, g. 1221 (36). Loughtor (Louetorre), Devon, 438 (1 m. 13). Louis XI., King of France (14611483), 535, 3185. LOUIS XII., KING OF FRANCE, personal references, 53, 130, 138, 140, 147, 154, 156, 162 (p. 85), 266, 292, 354, 367, 399, 406, 408, 413, 430, 432 ii., 434, 455, 463, 481, 526, 538, 601, 649, 670, 674, 6901, 702, 724, 734, 759 ii., 761, 794, 809, 816, 850, 854, 858, 867, 902, 983, 1014, 1055, 1058, 1062, 1065, 1081, 1087, 1100, 1106, 1108, 1119, 1127, 1138, 1141, 1146, 11578, 1178, 1220, 1228, 1257, 1265, 1268, 1271, 1277 (pp. 5878), 1297, 1301 (pp. 594, 596), 1307, 13145, 1391, 14034, 1491, 1504, 1575, 1584, 1601, 1615, 1622, 1624, 1647, 1665 (p. 763), 1689 (p. 774), 1694, 1735 (p. 792), 1750, 1754, 1764, 1787, 1825, 1908, 1916, 1919, 1931, 1933, 19378, 1953, 1980, 1999 (3), 2014, 2029, 2038, 2067, 2083, 2092, 2107, 2116, 2119, 2122, 2126, 2128, 2132, 2142, 2154, 2157, 2164, 2169, 2182, 2198, 2204, 2209, 2212, 2229, 2238, 2242, 2247 (2), 2267, 22756, 2287, 2294 (2), 2311, 2379, 2396, 2443, 2461, 2475, 2513, 2523, 2561, 2592, 2596, 2601, 26656, 2681, 2703, 2710, 2729, 2770, 2791, 2793, 2859, 291721, 2928, 2945, 2955, 3004, 3009, 3034, 3041, 3072, 3101, 3151, 31556, 3173, 3178, 3191, 32012, 3206n, 3230, 3240, 3252, 3256, 3264, 3266, 326970, 3285, 3292, 32945, 3328, 3331, 3334, 3342, 3348, 3357, 3361, 3364, 336970, 33756, 33789, 3387, 3411, 3416, 3418, 3424, 3430, 3435, 34401, 3449, 3461, 3472, 3477, 3482, 3485, 34967, 3540, 35446, 3585:App. 10, 11:g. 449 (19), 519 (47), 751 (2), 3226 (21). See also France, government. -, -, letters &c. from, 113, 399, 470, 522, 536, 708, 758, 1328, 1501, 1909, 192930, 1959, 2071, 2150, 2156, 2275, 2297, 2399, 2871, 2934, 2957, 30983100, 3124, 3217, 3225, 3232, 3244, 3323, 3498, 3580. -, -, letters to, 5834, 6579, 740, 755, 782, 870 (3), 1018, 1140, 1224, 1709, 2047, 2080, 2919, 3147, 31867, 3189, 3224, 3358, 33801, 3393, 3440, 3563:pp. 1527, 15312:App. 19. -, -, illness of, 162 (p. 85), 3569, 3576. -, -, commissions by, 1243, 1273. -, -, intended interview with Henry VIII., 3201, 3331, 3342, 3411, 3416, 3424, 3430, 3452, 3486, 3500, 3531, 35478, 3574. -, -, marriages for (suggested), 3009. -, -, niece to marry Julian de Medici, 2242. -, -, obligation by, 3066. -, -, pensioners or "hundred gentleman of the guard" of, 2110, 2172, 2173 (3), 2254 ii., 2392 iii. -, -, proposed meeting with Maximilian, 83, 130, 162 (p. 84), 565. -, -, his steward (in 2173 3 called Longueville's steward), 2292 iii. Louis of Hungary, son of King Ladislaus, marriage with Prince Charles's sister Mary, q.v. Louis Monsieur. See Cleves. L. de. Lounde (Londe), Rob., vicar of Guisbrough, 1803 (1 m. 4). Louth (Lowthe), Linc., 438 (1 mm. 2, 6), 436 (2 m. 13), 438 (3 m. 10), 438 (4 mm. 22, 25):g. 1494 (55). -, -, abbey of or of Louth Park, 438 (2 m. 21). -, -, -, abbot. See Walker, G.
Louthe (Lowthe), Th., 438 (4 m. 1):p. 1538:g. 414 (55), 587 (1), 1602 (10), 2222 (16 Hunts.). -, - (Lowthe), Wm., goldsmith, 438 (1 m. 6). -, - (Lowth), Wm., prior of Walsingham, 136:g. 3408 (28). Loutotreuce (i.e., l'Haute Autriche). See Austria. Louvain (Loven), 1546, 2404 iii. (see Notes and Errata), 29401, 2995 (p. 1294), 3018. -, -, letter dated at, 1547. Lovayne, lord of. See Ewe and Lovayne. Lovat (Lovetus), Lord, slain at Flodden, 2246 (4), 2313. Love, Ant., g. 1462 (36). -, -, John, 1313:g. 1948 (25). -, -, Nic., gunner, g. 1172 (14), 1266 (29). -, -, Reynold, g. 2772 (22), 2862 (10). -, -, Wm., 20 (p. 13). Loveday, Henry, 1803 (2 m. 2). -, - (Lovedey, Louedey), John, 20 (p. 18), 82 (p. 40), 438 (1 m. 13), 707 (p. 383). -, -, Noel, 82 (p. 39):g. 1836 (10). -, -, Walter, ship captain, 1413, 1600, 1661 (3, 4), 1869 iii., 2304 (3), 2305 ii. bis, 2652, 2686, 2714, 2846. -, -, Wm., g. 3408 (33). Lovedown (Levedown), Essex, near Hockley, 438 (4 m. 1). Lovekyn, Arthur, 20 (p. 15), 82 (p. 41), 877n. -, -, Arthur, King's scholar, 954. 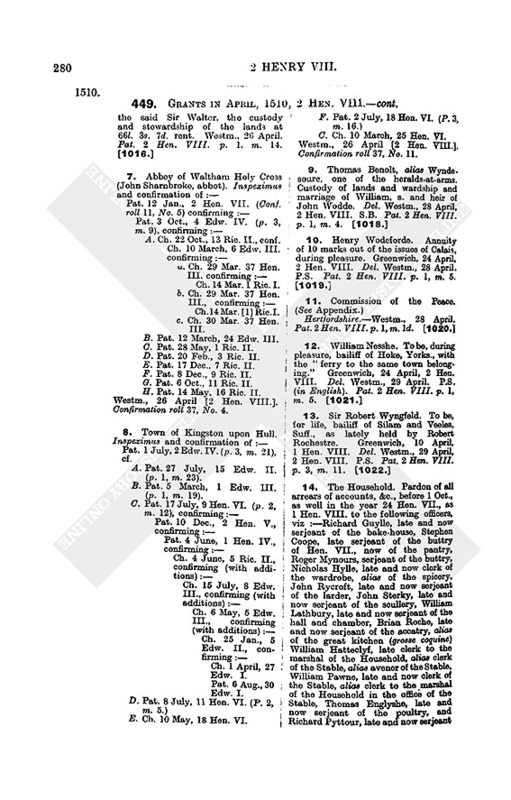 -, - (Lokekyn, Lufkyn), George, clerk of the Stable, 20 (p. 19), 82 (p. 40), 370, 428, 453, 506, 540, 605, 1022, 1177, 1255:g. 218 (48), 563 (9). Lovelas or Loveles,, of Kent, 309. -, -, Sir Ric., under-marshal of Calais (temp. Henry VII. ), g. 784 (25), 833 (36), 857 (10), 2055 (62). Lovell, Francis or Sir Francis, viscount, attainted, 1493 vi.:g. 257 (65), 563 (12), 709 (14, 31), 804 (10), 833 (12, 14), 885 (10), 1044 (10), 1172 (7), 1221 (23), 1266 (9, 12, 33), 1316 (4), 1365 (19), 1415 (3, 11), 1662 (58), 1948 (31), 2055 (131), 2535 (8, 10), 2617 (20), 2684 (82), 2772 (11, 51), 2863 (10), 2964 (44), 3049 (8), 3324 (32). -, -, Sir Gregory, 438 (1 m. 19). -, -, Henry, g. 257 (53). -, -, Sir Rob., 20 (p. 15), 1661 (3):p. 1541:g. 132 (26), 381 (43), 414 (4), 833 (58), 2222 (16 Norf.). -, -, Rob., g. 784 (22). -, - (Lowell), Sir Thomas, K.G., treasurer (or keeper of the Great Wardrobe) of the Household, "Mr. Treasurer," &c., 1, 19, 20 (pp. 13, 17, 20), 37, 589, 82 (pp. 389), 104, 118, 168, 193 (p. 104), 362, 438 (2 m. 14), 438 (4 m. 24), 442, 559 (p. 327), 582, 893 (2), 1004 (3), 1176 (1, 2), 1280, 1322, 1427, 1446, 1493, 1589, 1661 (3, 4), 1673, 1715, 1903, 2067n, 2163, 2269, 2325, 2470, 2604, 2838, 2913 (p. 1261), 2974, 3087, 3135, 3137 (16), 3154, 3268, 3377, 3502:pp. 1507, 1509, 1512, 1515, 15189, 1533, 1538, 15401, 1542 bis, 15434:App. 14, 21:g. 94 (35, p. 50), 132 (35, 51, 91, 115), 158 (24), 218 (53, 57), 289 (5, 32), 381 (19), 731 (278), 749 (24, 44), 784 (16, 36), 804 (8, 29, 31,) 833 (5, 50 ii. ), 969 (17), 1083 (41), 1123 (15), 1170 (7), 1266 (10), 1316 (4, 11), 1365 (19), 1494 (46), 1732 (2, 41), 1948 (85), 2055 (60, 80, 104), 2222 (12, 16 Midd., London, 2330 (3, 4), 2484 (17, 27), 2684 (41), 2964 (53), 3408 (37). -, -, -, letters from, 2974, 3087. -, -, -, recognisances made to, g. 54 (3), 94 (99), 132 (18, 34), 218 (24, 59), 257 (80), 289 (6, 44), 357 (10), 381 (108), 414 (46), 449 (18), 485 (42), 651 (7, 32), 682 (3), 749 (24), 784 (56), 804 (6, 49), 3499 (41). -, -, -, signature of, 19, 589, 118, 168, 265, 313, 404, 716, 820, 845, 2308, 2441, 2832 v.:pp. 150910, 1515, 1520:g. 11 (12), 54 (33, 489), 94 (43), 132 (65), 190 (19, 25, 35, 41), 218 (33), 257 (26, 37), 414 (48, 52), 448 (1), 519 (5), 604 (18, 256), 651 (7), 731 (7, 19, 52), 749 (3), 1003 (15, 17), 2222 (12), 2535 (29), 2684 (17), 2772 (58), 2863 (8, 9, 13), 2964 (45), 3499 (60), 3582 (15, 26). -, -, Sir Th. [junior], knighted at Tournay, 2301, 3575 ii. -, -, Th., of Norfolk, 438 (1 m. 19). -, -, Wm., p. 1536. -, -, William lord Morley, q.v. Lovere, in Flanders, 2404. See Notes and Errata. Lovet (Lovette), John, 438 (1 m. 25):g. 1462 (15). -, -, Th., 438 (3 m. 10), 438 (4 m. 1):p. 1541:g. 546 (59). 2484 (9), 3499 (12). Lovicot (Londcote), Devon, [in Harwood], 438 (2 m. 27). Lowchampe, Pierre de, French prisoner, p. 928. Lowder. See Lowther; also Lauder. Lowdham, Notts, 1803 (1 m. 6). Lowe, Ant., 20 (p. 18), 82 (p. 41). See also Love. -, -, Dionisius, g. 2772 (2). -, -, Humphrey, g. 2772 (2). Lowestoft (Leystoft, Loyestofte, Lastop, Laistofte, Levestoft), Suff., 438 (2 m. 24), 438 (4 m. 29), 1262 (p. 578), 1672, 2671:g. 94 (35), 94 (56), 682 (33). -, -, ships of, 1982 (4). Lowick (Lowyke), Ntht., 438 (3 m. 8). Lowman, Wm., master cook, 20 (p. 18):g. 94 (78). Lowrans, Th., rector of Conesholme, g. 190 (42). Lowre (Loure, Lower), Wm., 676:p. 1535:g. 833 (58 iii. ), 2222 (16 Cornw. ), 3324 (24), 3408 (4). Lowson, Th., g. 651 (25). Lowther (Louther), Cumb., 438 (3 m. 24). Lowther (Louthre, Lother, Sowder), Westmld., 438 (3 m. 27), 438 (4 m. 26). -, -, rector of, p. 1525. Lowther (Lother, Louthre, Loughre), Sir Hugh, 438 (3 mm. 27, 34):g. 257 (49). -, - (Loder, Louder), James, gentleman usher, 20 (p. 14):g. 885 (10). -, - (Lowder, Lother, Louther), Lancelot, gentleman usher, 20 (p. 15), 3313 (6):g. 54 (77), 190 (26), 784 (37). Loxley (Loxeley), Staff., g. 969 (59). Loyall, Wm., 2542:pp. 1512, 1514. Loye, Th., brewer, g. 1083 (38). Lozano, Fray Alonzo, envoy of King Ferdinand to Rome, 2887. Lubbesthorpe (Lublesthorp), Leic., 438 (2 m. 12). LUBECK and the Lubeckers, 247, 285, 462, 547, 1155, 121011, 1330, 1336, 1731, 2973, 3196:p. 1516. -, -, letter to the Council, 1730. Lubiana (in Austria ? ), 3014 ii. Laybach? Lucas, John, vicar of East Pennard, 438 (4 m. 24). 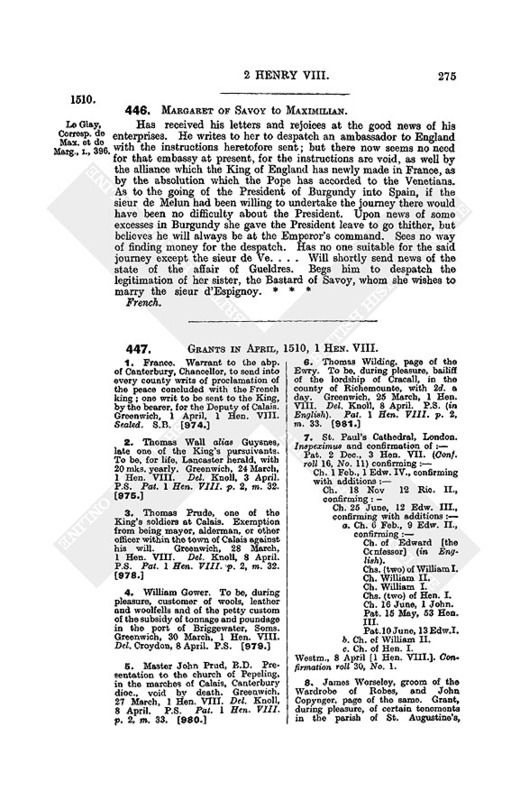 -, -, Thomas, solicitor to Henry VII., 438 (1 m. 6), 1176 (1 iii., 2), 1493:p. 1544:g. 132 (25, 115), 289 (5), 381 (37), 519 (62), 731 (14), 969 (38), 1316 (4). 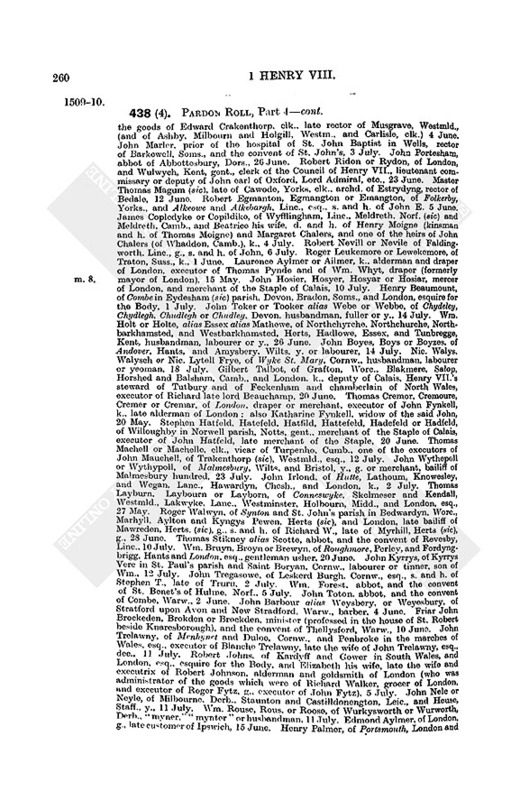 -, -, -, recognizances made to, g. 54 (3), 94 (99), 132 (18, 34), 218 (24, 59), 357 (10), 381 (108), 414 (46), 485 (42), 651 (32), 682 (3), 784 (56), 1316 (26). Lucca (Luke, Luce), in Italy, merchants of, 438 (3 m. 25 bis), 1493 vi., 2832 (iv., v.):pp. 150911:g. 257 (67), 651 (30), 731 (52), 1170 (11), 1266 (40), 1462 (20), 1662 (15), 1804 (38), 1836 (23), 1948 (74), 2055 (5 ii., 33, 101), 2861 (19), 2964 (82), 3107 (5). Lucerne, in Switzerland, 2144, 2771, 3534. Luckham (Lukcomme), Soms., 438 (4 m. 15). Luon, M. de, letter from, 2241. Lucton (Luctone), Heref., 438 (3 m. 17). Lucy, Anne, 438 (1 m. 1). -, -, Edm., 438 (1 m. 1):g. 132 (15). -, -, Sir Edmund, 20 (p. 15), 438 (2 m. 8), 438 (3 m. 5), 1176 (3), 1661 (p. 752), 2759:p. 1533:g. 833 (31), 2222 (16 Beds). -, -, Eleanor, wife of Sir Edmund, 438 (2 m. 8), 438 (3 m. 5). -, -, Elizabeth wife of Sir Thomas, 1410, 1673. -, - (Luci), Joan widow of Edmond, 438 (4 m. 14). -, -, John, g. 132 (15). -, -, John de. See Lusy. -, -, Richard de (temp. Hen. II. ), g. 2964 (67). -, -, Th., 20 (p. 13), 82 (p. 43), 201, 388, 653, 698, 822, 853:p. 1541:g. 132 (15), 190 (31), 604 (22), 1494 (17). -, -, -, signature, 698. -, -, -, livery of lands, g. 132 (15). -, - (Lucee), Sir Thomas, ship captain, 1396, 1398, 1410, 1453 ii., v., 1661, 1673, 1951, 2053 (1, 2, 3, 5 ["Bury"] 6 ii. ), 2480 (9), 3492, 3535, 3551:App. 26. -, -, Sir Wm., 438 (1 m. 1):g. 132 (15). Lucyan or Lusynen, Jean de, French prisoner, 2053, 2172:p. 928. Ludbroke (Lodbroke, Lodebroke), John, 438 (3 m. 6). Ludbrook (Sutludbroke), Devon, 438 (1 m. 18). Luddenbeg (Lugden), co. Limerick, p. 1530. Ludder river, in Scotland, p. 1260. Ludeyate, Wm., chaplain, g. 682 (29). Ludgarshale, Wilts, 438 (3 m. 5):g. 632 (30). Ludgarshall (Lurgathall, Lurgessale), Bucks, 438 (3 mm. 13, 27). Ludigan [co. Wexford ? ], p. 1525. Ludlow (Liddelowe, Luddelowe), Salop, 438 (1 m. 13), 438 (2 mm. 13, 30), 438 (3 m. 16), 438 (4 mm. 14, 20), 1803 (1 m. 2):g. 651 (24). -, -, letter dated at, 1174. -, -, confirmation for, g. 381 (103). -, -, Guild of palmers, g. 784 (10). -, -, Guild of St. Mary, 438 (2 m. 7). -, -, porter of the castle, g. 94 (10). -, -, rectory of St. Laurence, p. 1523. Ludlowe, John, 438 (1 m. 10):g. 2484 (9), 3499 (12). -, -, Maurice, g. 519 (57). Luffe, John, 1803 (2 m. 5). -, - (Luff), Wm., 438 (1 m. 22). Luffield, Ntht., g. 1316 (15). -, -, chapel of St. Thomas, g. 1316 (15). -, -, priory, g. 1316 (15). Lufton (Lukton), Soms., 438 (2 m. 4). Lufton, Ric., mayor of Chichester, 438 (2 m. 34). Lugano (Lucam, Ligan), in Italy, 1127 (p. 539), 1277 (p. 587), 1566, 1647. Luke, Anne, the king's nurse, 82:g. 132 (39), 1221 (18). -, -, Walter, husband of Anne, pp. 1533, 1538:g. 132 (39), 381 (78), 804 (28), 924 (37), 2222 (16 Hunts). Luky, Wm., late vicar of Lyminge, &c., 438 (2 m. 6). Lullingstone (Lullynston), Kent, 438 (3 m. 7):g. 632 (70), 2055 (95). Lulworth, Dors., 438 (2 m. 11). Lulworth, East- (Estlulleworth), Dors., 1803 (1 m. 1). Lumbard, John Antonyn de, 1568. Lumbier (Lumbierre, Alumberry, Allambure), in Navarre, 1320, 1326 (p. 613), 1327. Lumley (Lomley), Sir John lord, knighted after Flodden, 2239, 2246 (4 ii. ), 3464. -, -, Richard lord, 205, 963. -, -, -, letter to, 291. Lumsden (Lummisden), Thomas, merchant of Copenhagen, herald, 302, 665. Lund (Lunden), in Denmark, abp. of [Byrger Gunnari], 285. Lund (Lound), Yorks, 438 (1 m. 9). Lunenburg, in Germany, senate of, 285. Lupset, Th., goldsmith, 438 (1 m. 24). -, -, Thomas, 2088, 2133, 2418. 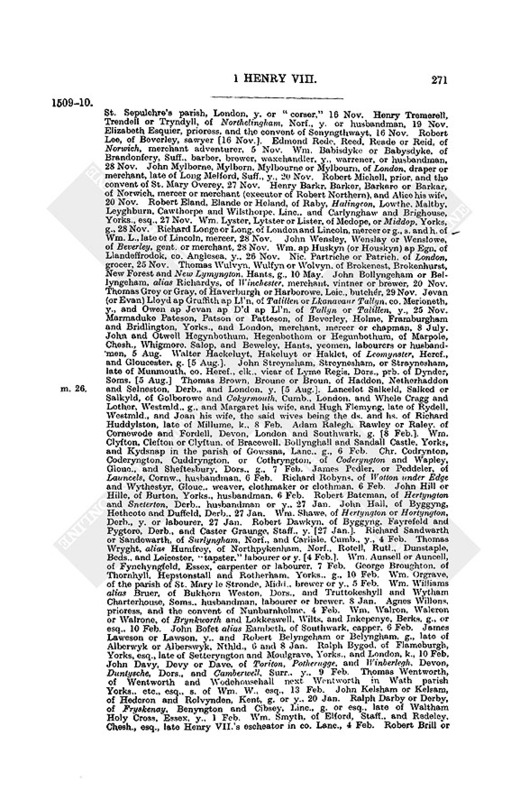 Lupton, Ralph, M.A., rector of Torrington, g. 2861 (9). -, -, Dr. Roger, King's chaplain, provost of Eton, clerk of the Hanaper, 19 (p. 11), 20 (pp. 12, 14), 341, 438 (3 m. 29), 579, 644, 875, 1046, 1406, 1549, 2439, 3313 (6). 3315, 3594:p. 1534:g. 132 (113), 158 (72), 414 (62), 784 (44), 1365 (6), 2055 (61), 2964 (36), 3324 (44), 3408 (25). -, -, -, signature, 644. -, -, -, account as clerk of the Hanaper, 579. Lurcombe (Lourchecomb, Linthecombe), Devon [in Bickington], g. 447 (9), 3499 (48). Lusa, M. de, his castle in Navarre, 2006 (p. 907). Lushington (Luchyngton), John, g. 1804 (6). Lusk (Luske), in Ireland, 3583. Lussher, Ric., g. 2535 (11). Luststruther (Lurchestrother), in Scotland, 2443. -, - (Lucy, Luse), Jean de, lieutenant of the Prince of Castile's ordnance, 1950 (2), 2135, 23834, 2414, 2492, 2751, 2767:g. 2772 (60). Luton (Leuyton), Beds., 438 (4 m. 15). -, -, Guild of Holy Trinity, 438 (3 m. 25). Luttichawe (Luittichau), Sir Sigfried, councillor of George duke of Saxony, 729, 811:g. 804 (14). Lutton, Ntht., 438 (1 m. 25). Luttrell (Loterell, Lotrell, Luterell, Lotterell, Lutterell), Sir Hugh, 20 (p. 15), 438 (3 m. 4), 1176 (3), 1661 (p. 753):p. 1543:g. 2222 (16 Soms.). Luxemburg (Lusshyngbourne), 1481, 2095 ii., 2101, 2106, 2144, 3174. Luxemburg (Lutzenburg, Lutsenburgus), Ant., steward of the abbot of St. Bertin at St. Omer, 2223, 2724. -, - (Luxonbroght), Charles de, a captain of the sieur de Fiennes, 2995. -, -, Jacques de, sieur de Fiennes, q.v. Luxilion (Lossilyon), Cornw., 438 (2 m. 25). Luzzara (Luceria), in Mantuan territory, 1301 (p. 596). Lyance or Lyaunce, Lewis, g. 2684 (43). Lydd (Leed, Lyde), Kent, g. 289 (17), 2862 (7). Lyddington (Liddington, Ledyngton, Ludyngton, Luthyngton), Rutl., 438 (1 m. 16), 438 (2 m. 14), 438 (4 mm. 3, 6 bis). -, -, grant dated at, g. 857 (10). Lydiard Bishop's (Lidiare Episcopi), Soms., 438 (4 m. 17). Lydiard Tregoose, Wilts, 438 (2 m. 34). Lydley (Lyddelowe), Salop [in Cardington], 438 (3 m. 2). Lydlinche (Ludclynche), Dors., 438 (1 m. 11). Lydney (Lydenea), Glouc., 438 (1 m. 23):g. 1524 (47). -, -, vicar of, 438 (1 m. 3). Lygh. See Lee; also Leigh. Lygon, Ric., p. 1546:g. 546 (58), 1494 (60). Lyle, Lyley or Lylle. See Lislc. Lymbryk, Isabel, 438 (3 m. 16). Lyme, Chesh., 438 (3 mm. 13, 33), 438 (4 m. 16). Lyme (Lyeme) or Lyme Regis, Dors., 438 (1 m. 21), 874 (2), 1801, 3313 (6). -, -, confirmation of charters, g. 632 (62). -, -, prebendary of, 438 (2 m. 9). -, -, vicar of, 438 (3 m. 21), 438 (4 m. 25). Lyminge (Lymmyngge), Kent, vicar of, 438 (2 m. 6). Lymington (Lemyngton), Hants, 438 (4 m. 2), 1882:g. 1083(2). -, -, letter dated at, 1613. Lymington (Lyanyngton), Soms., rector of, p. 1526. Lymington, New-, Hants, 438 (3 m. 5), 438 (4 m. 25). Lympyn or Lympeny, John, 438 (3 m. 31):g. 132 (57). -, -, Wm., g. 924 (36). Lynce or Lynche, in Germany. See Lintz. Lynche, Mr., 20 (p. 13). -, - Wm., 438 (2 m. 13). Lyncoll, Th., of Brentwood, 176. Lynde (Lyende), Robert, 438 (4 m. 11). -, - (Lyne), Th., 438 (3 m. 6):pp. 1536, 1543:g. 2484 (9). Lynden, Henry, denization of. g. 833 (9). Lyndon, Rutl., 1803 (1 m. 6). Lyneham (Lynam), Devon [in Yealmton], 438 (1 m. 25), 438 (2 m. 12):g. 3499 (73). Lyneham, Lynam, Lynham or Lynom, Th., 438 (3 m. 16), 2766:pp. 15378, 1543, 1546:g. 414 (48, 52), 1123 (20), 1316 (9), 2055 (42). Lyng, Soms., g. 804 (52). Lyngham or Lyngon. See Lingen. Lynn (Lenne, Lenn, Lene), or Bishop's Lynn, Norf., 438 (1 mm. 3 bis, 19, 20, 23, 25 bis). 438 (2 mm. 6, 25, 34), 438 (3 mm. 2, 4, 6, 16, 22, 26), 438 (4 mm. 3, 7, 12, 19 bis, 22, 24 bis), 874 (2), 1645, 1803 (2 m. 6), 2671, 3313 (6):p. 1505:g. 132 (124), 381 (43), 447 (23), 1266 (4), 2617 (6), 3107 (24). -, -, commission of the peace, p. 1540. -, -, confirmation of charters, g. 485 (28). -, -, Guild of Holy Trinity, 438 (1 mm. 1920), 438 (2 m. 25). -, -, Guild of St. George, 438 (1 m. 20). -, -, water bailiff of, g. 218 (48). Lynn, North-(Northlenn), Norf., 438 (1 m. 23). Lynn, South-(Southlyn), Norf., 438 (2 mm. 6, 26), 438 (4 m. 9). Lynn, West-(Westlenn), Norf., 438 (1 m. 23). Lynne (Lynd, Lyne), Edmund, 792, 798, 877n. bis, 1332, 2454, 2949, 3494. -, -, John, abbot elect of Jedburgh, 1433, 2461. -, -, Ric., 438 (2 m. 9). -, -, Rob., 438 (3 m. 17). -, - (Lynd, Lyne, Lenne), Wm., 438 (3 m. 28), 1803 (1 m. 3), 1803 (2 m. 4):p. 1548:g. 257 (49), 632 (26), 784 (2). Lynryche wood, Warw. [in Sutton Coldfield], g. 1044 (5), 3324 (27). Lyon, lordship of. See Holt. Lyon king of Arms, of Scotland [Henry Thompson]. 20 (p. 17), 153, 6656; [Sir Wm. Cumyng], 2122 (3), 21567, 2161, 2164, 2169, 2198, 2204, 2391 (p. 1059), 3468, 3481. Lyons, in France, 367, 413 ii., 794n., 942, 1301 (pp. 5956), 1647 (p. 743), 1895, 2069, 2074, 2107, 2113, 2128, 2198, 2237, 2259, 2307, 2373 ii., 2746, 3160, 3338, 3369, 3444, 3519, 3531, 3544, 3569. -, -, letters dated at, 850, 858, 2095 ii., 2169, 2241, 2307. Lyons, Gulf of (Mar de Lione), 1321. Lypiat (Lipiatt), Glouc., 438 (2 mm. 11, 24). Lypiat, Nether (Netherlupeyate), Glouc., 438 (3 m. 9). Lyrndall, Th., purser, 3148 iii. Lys, the Flemish river, 2170. Lytchet Matravers (Lichet Moutravers), Dors., 438 (4 m. 12). Lyte, Th., 438 (4 m. 12). Lythe, Yorks, rector of, 438 (2 m. 9). Lythe, Margaret, 1803 (2 m. 3). Lythwood (Lethewood), Salop, g. 257 (21). Lytton (Litton), Lady, 146, 559 (p. 327). -, - (Litton), Eliz., 438 (2 m. 18). -, -, John, clk., 438 (2 m. 5). -, -, Sir Rob., 1803 (1 m. 4):g. 1602 (13). -, -, Wm., 164, 1803 (1 m. 4):g. 632 (26), 2222 (16 Herts), 2684 (41).